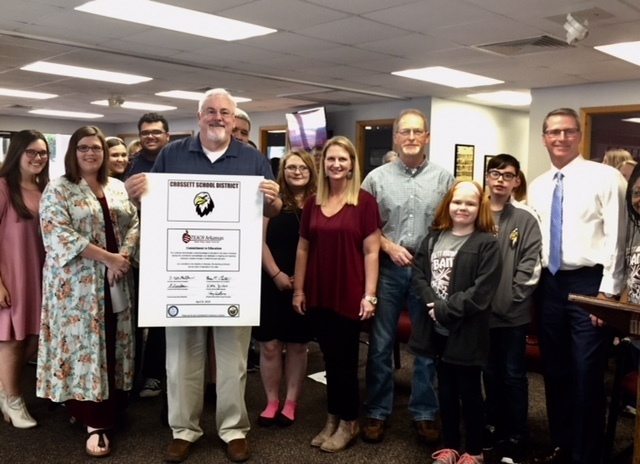 Crossett Learning Center students and staff pledge their support for education in Crossett by signing the Commitment to Education certificate! 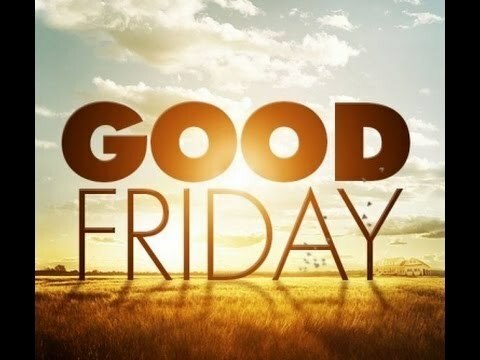 School will be dismissed this Friday, April 19th, in observance of Good Friday. Happy Easter! Listen tomorrow to Spotlight on CSD at 8 am on Q-Lite. The medical professions pathway will be the featured story with Janel Harper and students. 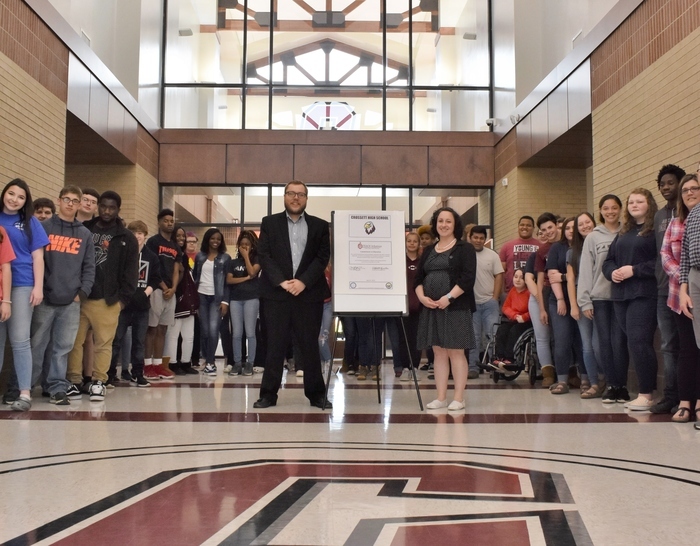 CHS celebrates those who have committed to the teaching profession by signing the Commitment to Education certificate, showing their personal pledge to the students of Crossett High School. . There will be a Crossett Middle School Band Recruitment Day for 5th graders, this Wednesday at 2:30, in the cafeteria. Parents are invited to attend. 6th Graders at Crossett Middle School will be taking the ACT Aspire test on Wednesday, April 17th and Thursday, April 18th. To help your child be more successful, please make sure he/she gets plenty of rest, eats a good breakfast, and arrives at school on time. Thank you. 5th graders at Crossett Middle School will taking the ACT Aspire test on Monday, April 15th and Tuesday, April 16th. To help your child be more successful, please make sure he/she gets plenty of rest, eats a good breakfast, and arrives at school on time. Thank you. 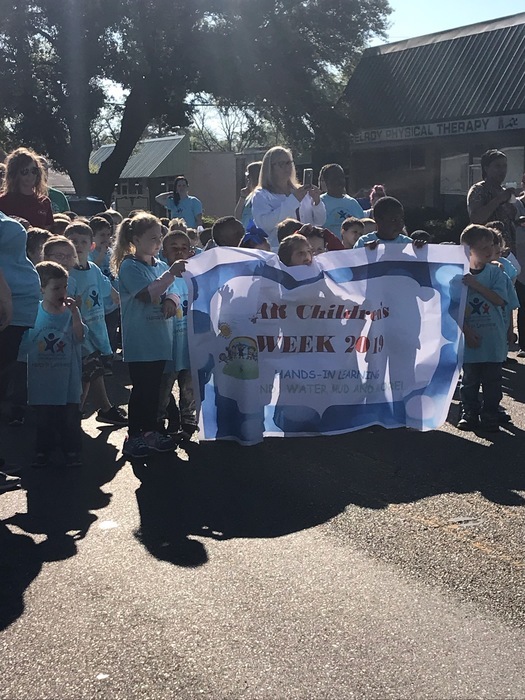 The PreK program at Crossett Learning Center is celebrating AR Children's Week with many fun activities for the students. Digging for dinosaur bones, building sand castles, floating boats and painting masterpieces are just a few of the fun learning activities this week. .
We want to congratulate CHS Senior Danni Dolan, representing The FFA Chapter of CHS who was a guest speaker for the Rotary Club meeting this week, along with Sammy Cox, CHS Career Technical Education teacher at CHS. 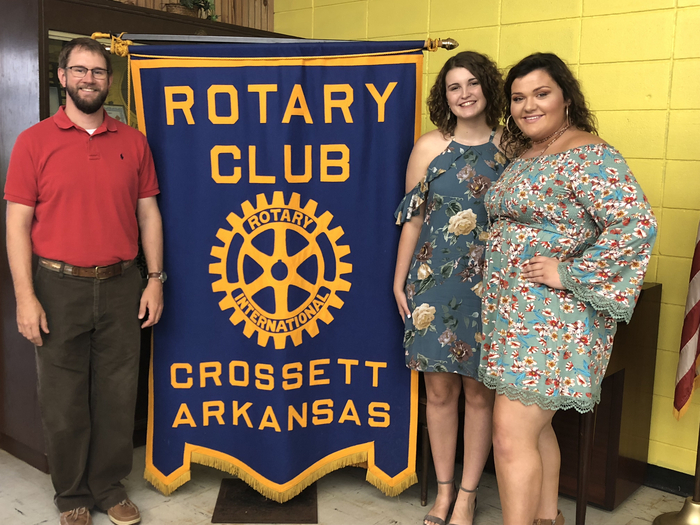 Congratulations to CHS Seniors Anna Hammons and Elizabeth Paige Thompson, who were honored this week as Jr. Rotarians of the Rotary Club of Crossett. 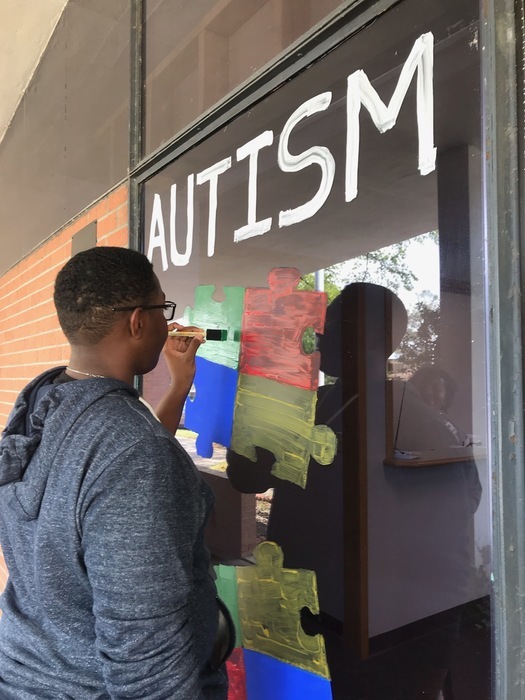 CMS celebrated those who have committed to the teaching profession by signing the Commitment to Education certificate, showing their personal pledge to the students of Crossett Middle School. .
One of our very own CHS students, Daishon, is painting our windows at the Administration Building for April which is Autism Awareness Month. He is very artistic and proud of his work and so are we! 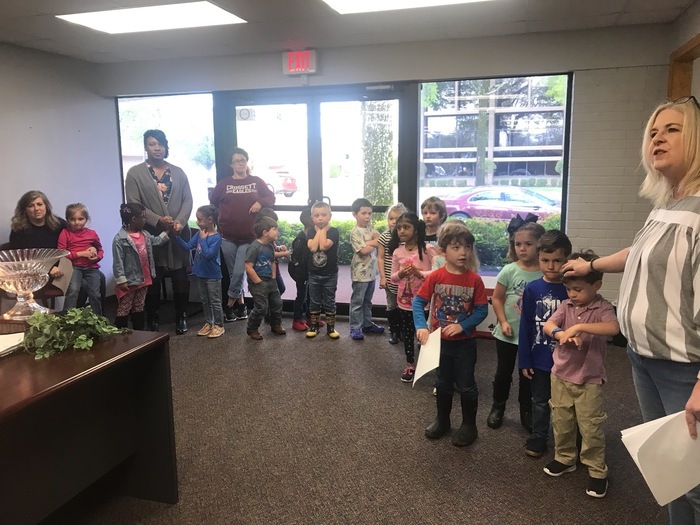 Pre-K came by the Administration Office today while marching in their parade to celebrate Arkansas Children's Week! They have so many fun activities planned this week! CMS will hold a PTO interest meeting on Tuesday, April 9, at 6:00 p.m. in the CMS Cafeteria. All parents interested in a middle school PTO are welcome to attend. Mrs. Culpepper, a teacher at CHS, has set up a "Dignity Closet" in her classroom. 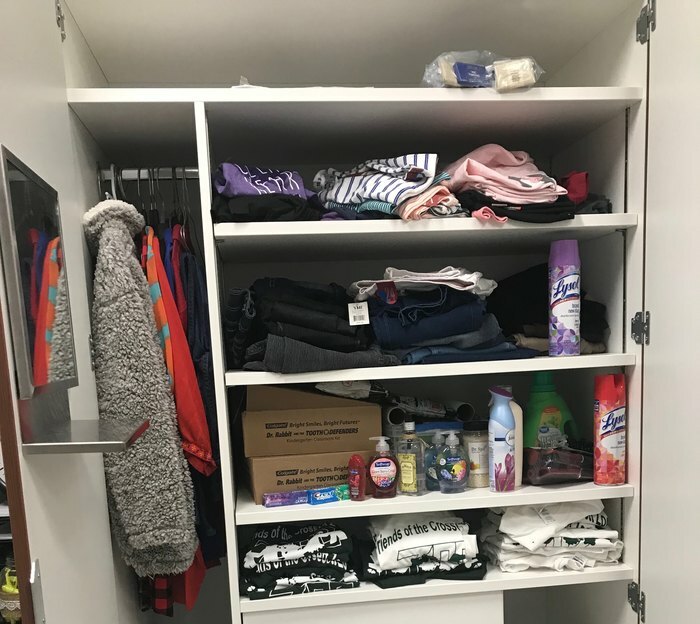 The closet provides students with clothing and toiletries that they may be in need of. She has received numerous donations, many anonymously, as well as received Amazon boxes at her home from anonymous people! She truly appreciates all of the kindness and donations. CHS student, Ryan Blissett, is doing a fundraiser to donate to many organizations and groups on the CHS campus, including the Dignity Closet! If you would like to donate, you may contact Mrs. Donna Culpepper at CHS. 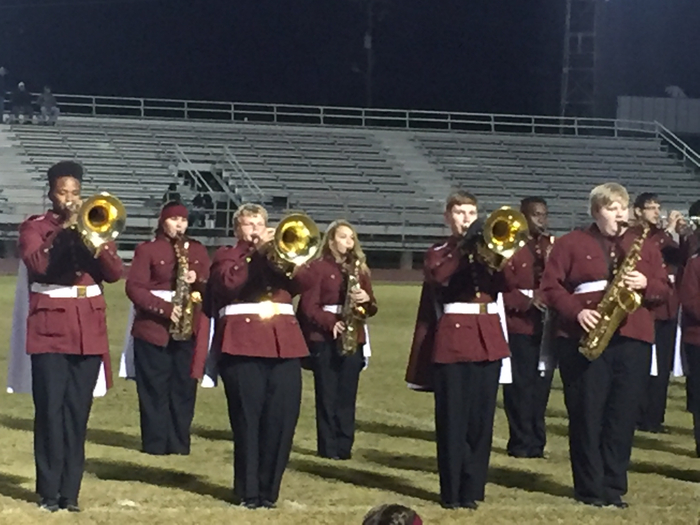 From the CMS Facebook page: Once again, the CMS band showed out! Forty students participated at Solo and Ensemble competition and they brought home 46 medals! Every single student competing earned a medal! They received 12 - 2nd divisions and an ASTOUNDING 34 - 1st divisions! Congratulations CMS Band and Mr. Waschalk! 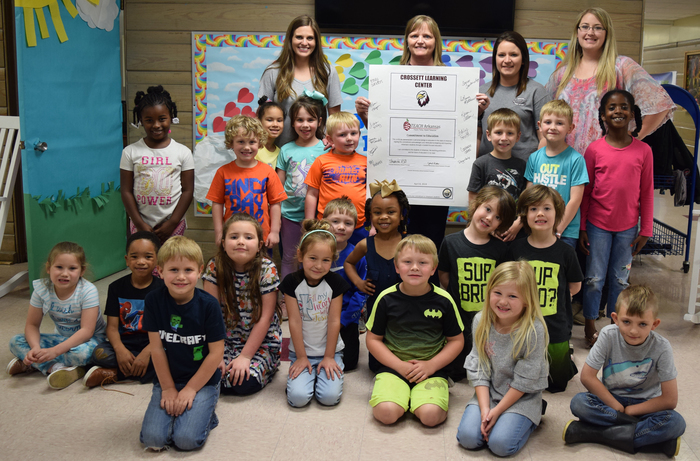 Mrs. Allen's Pre-K Class from Crossett Learning Center visited us today because they are preparing to celebrate Arkansas Children's Week next week! They sang us a couple of songs and told us about the fun activities planned for next week! 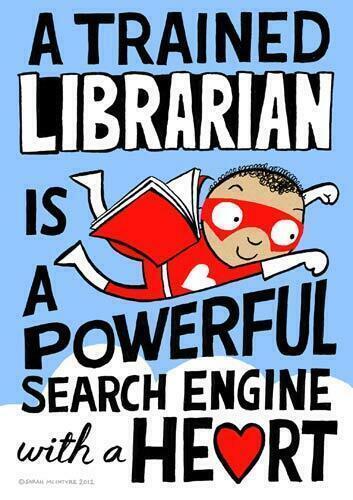 Happy National School Librarian Day to our 3 wonderful Librarians: Mrs. Leslie Mansur, Mrs. Jennifer White & Mrs. Lisa McCaughan! We appreciate all you do to encourage our students to read and learn! School Choice forms are due back to the Crossett Schools Administration Office by May 1! 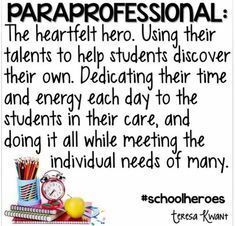 We have wonderful paraprofessionals who go above and beyond for our students each day! Thank you for all you do! We are proud to have you in our district! 3rd 9 Weeks Report Cards are being sent home with students today. Q-Lite's Spotlight on CSD's efforts to prepare students for college and careers today @ 8 a.m. The O.W.L. program at CHS will be featured. Tech Savvy ParentIng workshop tonight at 6 pm at CHS. Crossett School District invites you to join us for "Tech Savvy", a parenting workshop, at the CHS Auditorium on Monday, April 1st at 6 p.m. Speaker Brian Housmann will be discussing internet safety, social media, cyber bullying and more. You will leave the event with a working knowledge of these issues our students face daily and ways to safeguard your home and child. You are invited to attend a celebration for the OWL Program at the CHS Cafeteria on April 23rd from 5:30-7 p.m.! We congratulate the following staff members for being selected as the Classified Employee of the Year for 2018-2019. 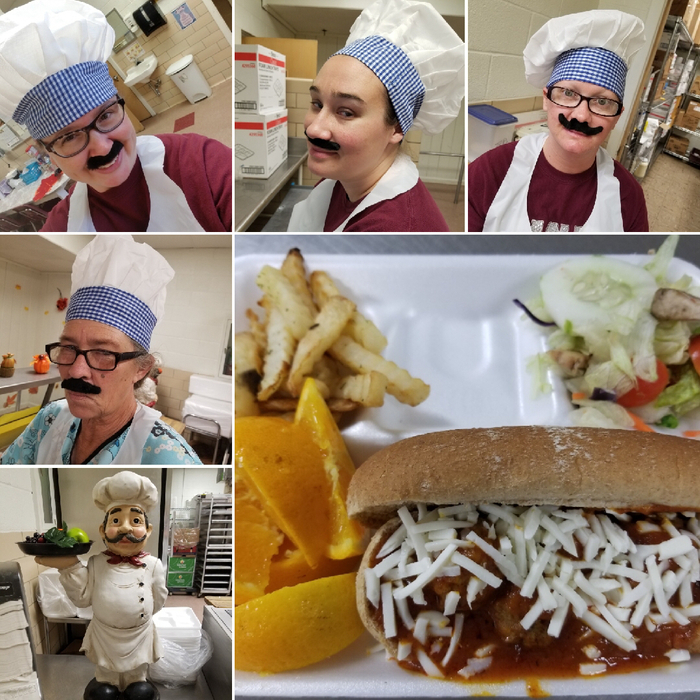 The staff members are Lynette Gonzalez from Crossett Learning Center, Mandy McElroy from Crossett Elementary School, Christy Rice from Crossett Middle School, Teresa Barnes from Crossett High School, Georgetta Waters from the Administration Building and Bobby Hale from Maintenance and Transportation. There will be a reception to honor these employees May 15 at 3:30 p.m. at the Administration Building, 219 Main Street. Family, friends and the community are invited to attend. We would like to congratulate the Teachers of the Year for 2018-2019 for each school in our District. The teachers are Briana Rodgers from Crossett Learning Center, Rosalynn Avery from Crossett Elementary School, Chuck Hollis from Crossett Middle School and Nick Adams from Crossett High School. There will be a reception to honor these teachers on May 15 at 3:30 p.m. at the Administration Building, 219 Main Street. Family, friends and the community are invited to attend. Spotlight on CSD tomorrow morning at 8 am on Q-Lite radio. The CHS welding program through UAM CTC will be featured. 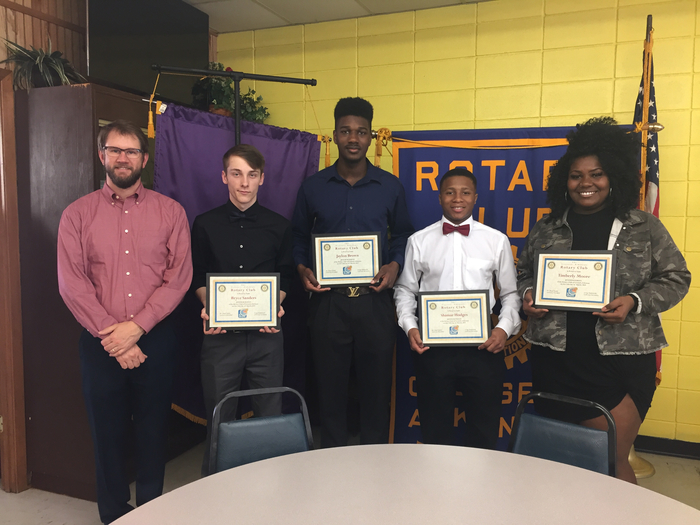 Congratulations to CHS Seniors Bryce Sanders, Jaylon Brown, Shamar Hodges and Timberly Moore for being recognized as Jr. Rotarians of the Rotary Club of Crossett! 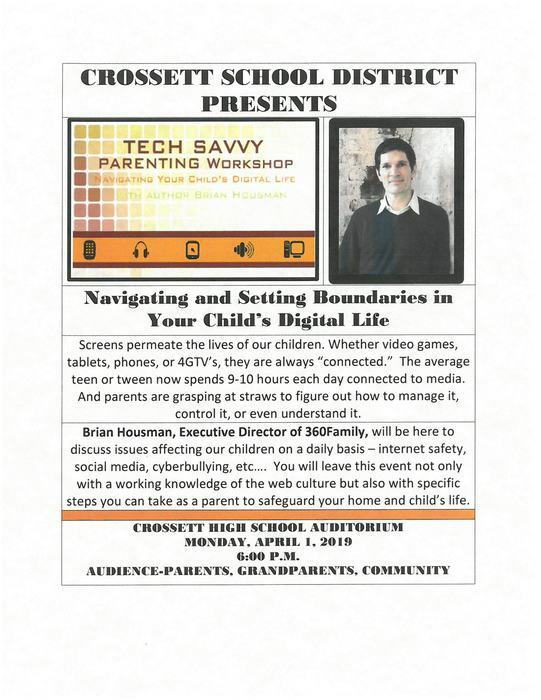 CSD presents a Tech Savvy Parenting workshop on navigating and setting boundaries in your child's digital life with Brian Housman, Monday, April 1, 2019 at 6 p.m. in the new CHS auditorium. Choice is Powerful! 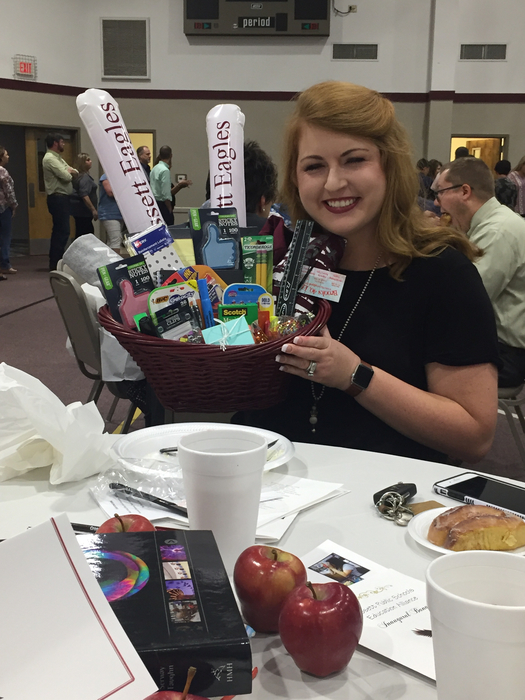 Apply now to become a Crossett Eagle! Parents of students not residing within the boundaries of Crossett School District, who would like for their children to attend the Crossett Schools in 2019-2020, under Arkansas Public School Choice Act, can obtain a formal application online at www.crossettschools.org under the District Forms link or from the Administration Building located at 219 Main Street, Crossett. The deadline for applications is May 1, 2019. For questions concerning School Choice, please call 870-364-3112. 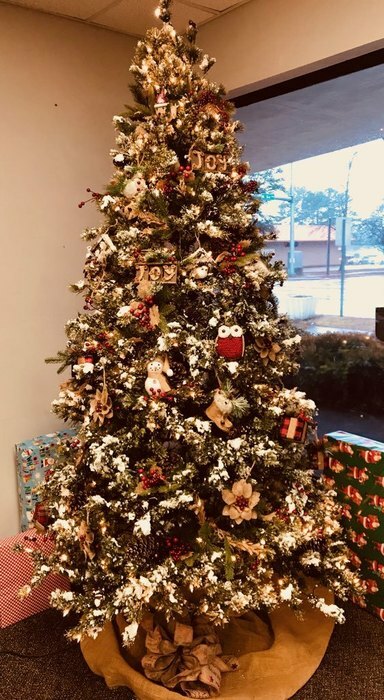 From CMS Engineering Eagles: Wow! What a day!! 2019 State Championship is in the books! It was a very emotional day and things didn’t always run smoothly...two teams had issues with parts breaking on their robots, but thanks to a suggestion from a team from another school, they were able to fix the issues and make it to the finals! My other team had a disappointing match up that caused them to drop in the rankings for finals match up...BUT with all of the disappointments today, we had some really great moments! All three teams scored their highest skills scores of the season! 6th grade and 7th grade were chosen for interviews with the judges for their Engineering Notebook! 5th grade team...let me just say that if there was a most improved award, this team would get it!! They went from scoring single digits at their first competition this season to scoring in the mid 20s today! Out of 121 teams in Arkansas, 5th grade is 24th, 6th grade is 16th and 7th grade is 5th in Skills!! In teamwork, out of the 38 teams that competed in the State Championship, 5th grade finished 16th, 6th grade finished 10th, and 7th grade finished 4th!! And how about these WORLD Skills standings: out of 3,074 teams, 5th grade is 879, 6th grade is 605, and 7th grade is 133!! All of those standings are impressive!! To say that I am proud of all of them would be an understatement! With all of this said, we did not come home empty handed! My 7th grade team won the Design Award and they will advance to the World Championship in Louisville, KY!!! I am so excited for them! Their Engineering Notebook and original robot design are AMAZING!! Now we prepare for Nationals in Council Bluffs, Iowa for all three teams April 1-3 and then on to Worlds for 7th grade April 28-30!! Congratulations to these teams! Way to go! It is our hope that over the next several weeks CSD can share with our community, through Wednesday morning interviews with Dennis Maxwell on Q-Lite radio, our belief that the power of education is a pathway to a great quality of life. 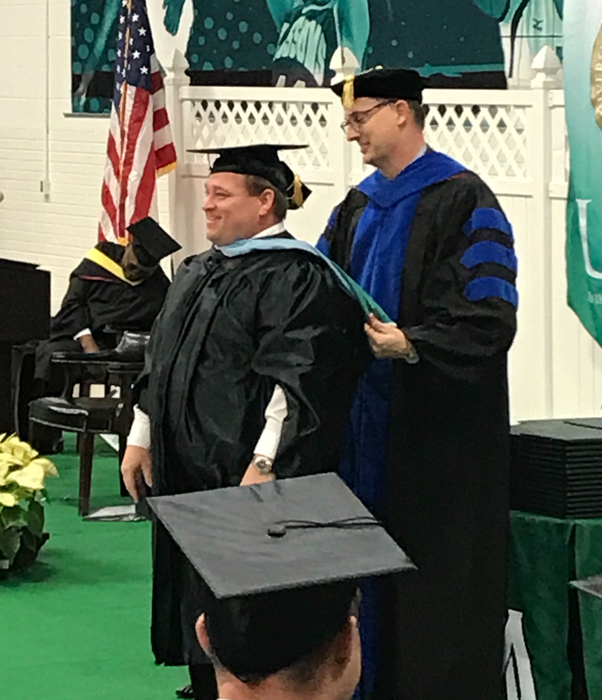 The many employees of CSD are dedicating their lives to inspire the next generation of students through the power of an education that provides them with the skills necessary to successfully transition to a post-secondary education or the workforce. Listen to Q-Lite each Wednesday morning at 8 a.m. and again at 9 a.m. on Thursday mornings on KAGH. Listen to Spotlight on CSD on Q-Lite at 8 am today to hear from Kristi Clanton, CTE teacher at CHS. Pre-K and Kindergarten registration for the 2019-20 school year will begin on March 26th at Crossett Learning Center, 305 Oak Street, Crossett. Children must be three-years-old by August 1, 2019 in order to attend Pre-K, and five-years-old by August 1, 2019 in order to attend kindergarten. Registration packets are now available in the front office of CLC. 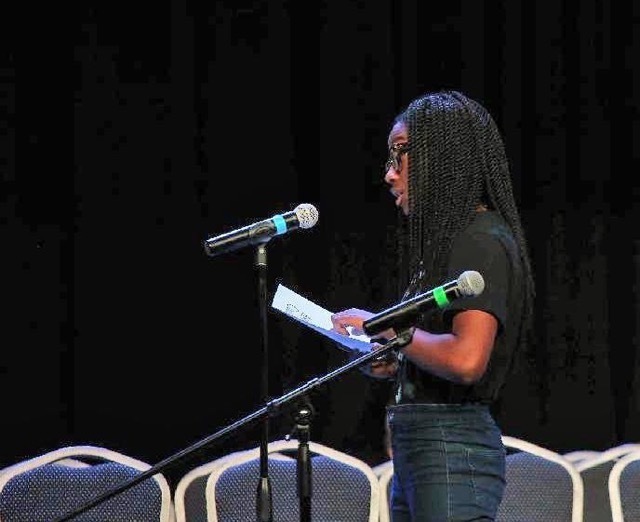 Congratulations to CMS student Trinity Foster for placing 4th in the State Spelling Bee! We are very proud of you, Trinity! Way to go! 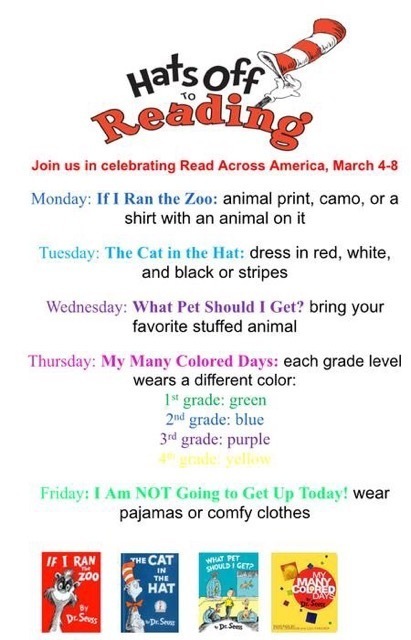 Crossett Elementary will be celebrating Read Across America next week! 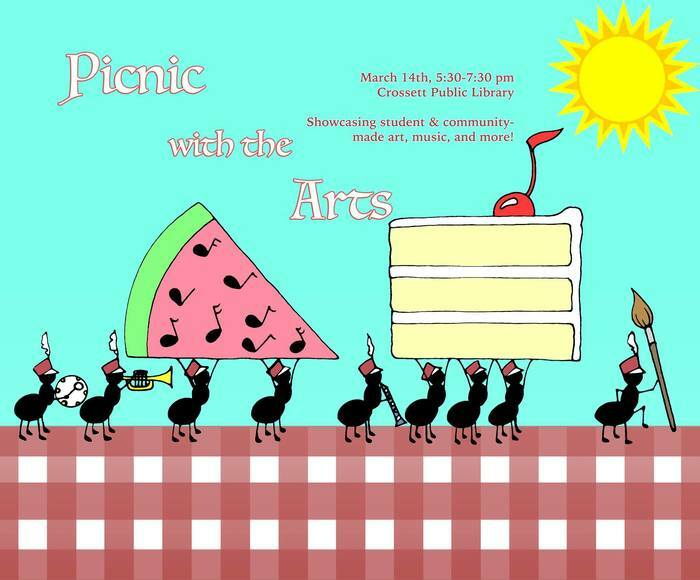 On March 14th from 5:30-7:30 pm, we'll be hosting our first-ever Picnic with the Arts at the public library. Our goal is to celebrate the fine arts in our school district and community. All students, Pk-12, and their families are invited. We're collaborating with our fellow music and art teachers to represent each school. The event will feature a student art exhibition, choir and band performances, local artist performances, folk dancing, and outdoor games. We are excited to share our students' talents with the community! 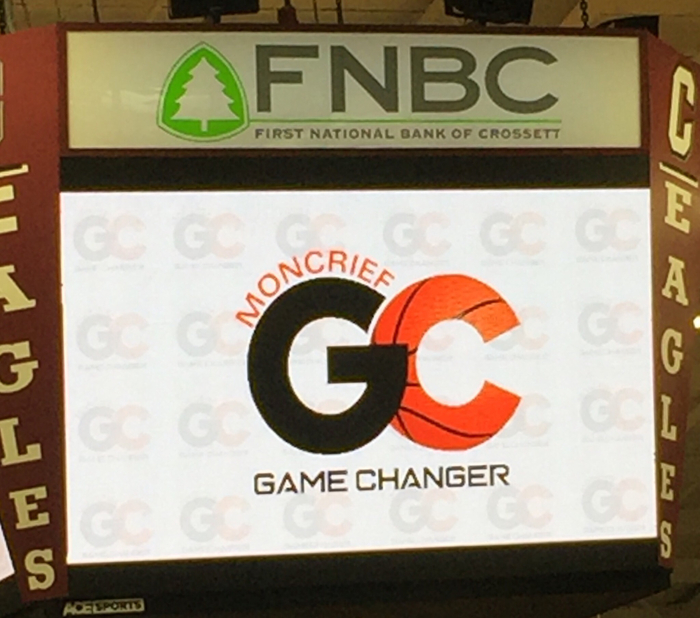 CHS is super excited to end the Career Fair with a presentation by Sidney Moncrief in the new gym.! Listen to Q-Lite Wednesday mornings at 8 am as CSD highlights programs offered to students that prepare them for college and careers. Due to the weather and worsening road conditions, Crossett School District will dismiss at 1 o'clock today. Stay safe! Thank you! CSD will be open today. Safe travels on your way to school and work! The potential for flooding overnight may result in school closure tomorrow. If school is to be closed, an announcement will be made as soon as possible and using the usual channels of Radio, TV, and social media. If we have a closure the district will use an AMI day. Be safe. Crossett High School will be hosting Project AWIN and Arkansas Rehabilitation will be training parents and school personnel on several topics on Wednesday, February 20 from 5:00 p.m. to 7:00 p.m. in the new auditorium at CHS. The Special Education Department would like to invite guardians and students out to learn more about SSI/SSDI. Tonight, the basketball game will begin at 6 p.m. with the Senior Night presentation beginning at 5:45 p.m. at the CHS Arena. Reminder: We WILL have school on Monday, February 18th. We are making up the day we missed in August. Congratulations to the CMS Archery Team for winning 1st place in the Region 12 ANASP tournament! 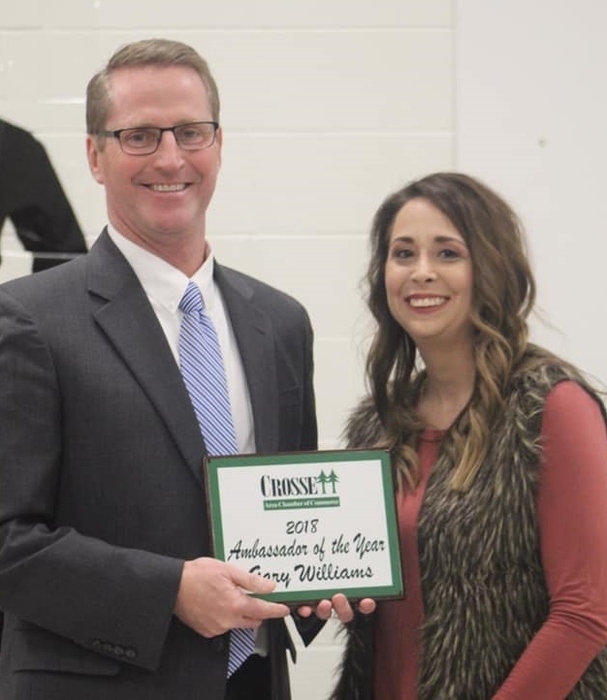 Congratulations to Gary Williams, Superintendent of the Crossett School District, for being presented the Ambassador of the Year Award at the Chamber of Commerce Banquet Thursday evening. 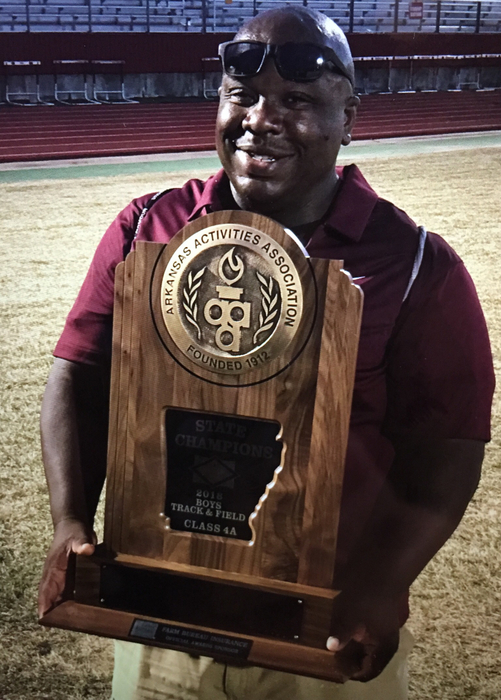 This award is given to an individual who has gone above and beyond in their effort to promote Crossett. 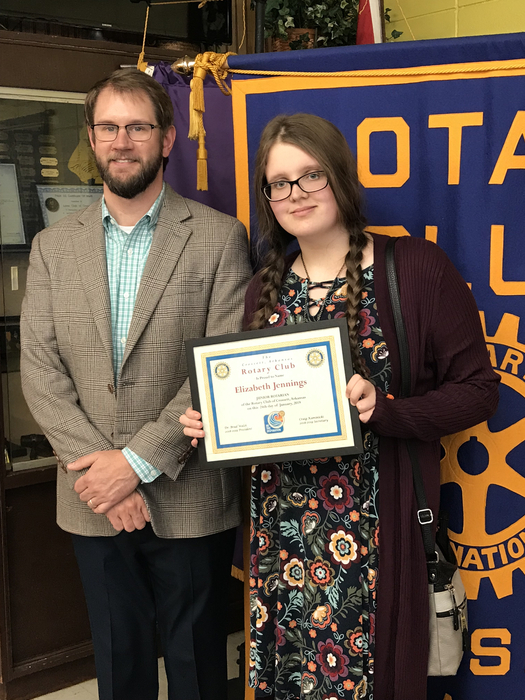 Congratulations to CHS Senior, Elizabeth Jennings, who was honored today as a Jr. Rotarian of the Crossett Rotary Club. 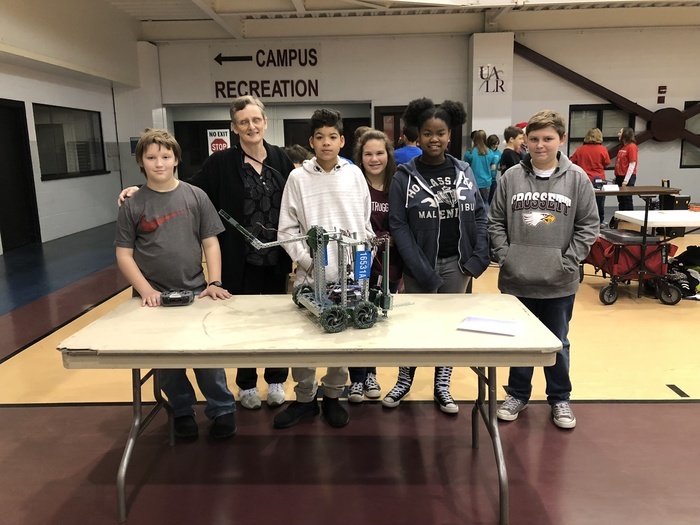 Only Michael Atchison and Jeffrey (JC) Chenos of the 8th grade robotics team were able to attend the UALR Middle School VRC Robotics Tournament held Jan. 19, 2018. 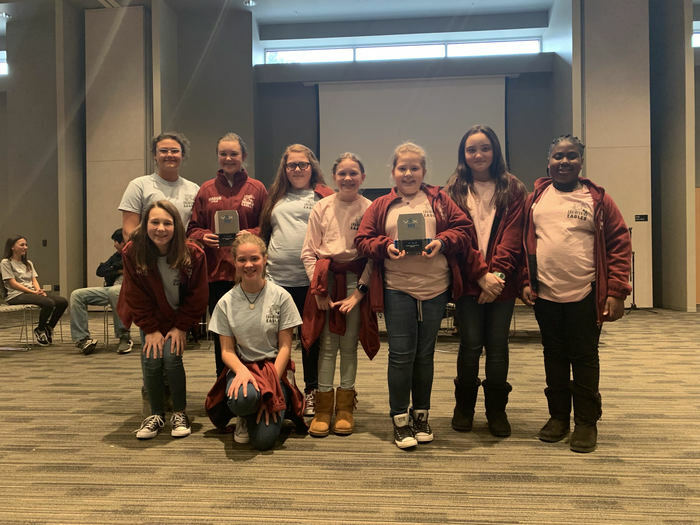 This team, led by Charre Todd, PLTW teacher at Crossett Middle School, brought home 3 trophies: Tournament Champions, Robot Skills Champions, and Team Excellence. We are super proud of these students and their teacher! 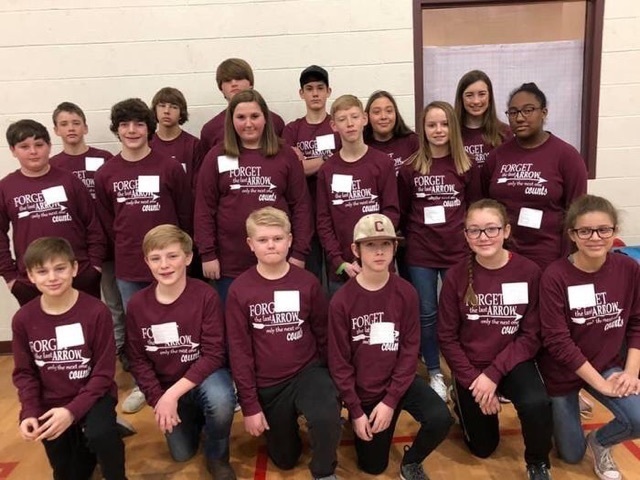 Some GREAT news from Crossett Middle School Robotics: The 8th grade CMS Eagles Robotics team was represented by Michael Atchison and Jeffrey Chenos Saturday at the UALR Winter Tourney. The team ranked 2nd during the qualifying matches. They partnered with a team from Bryant and breezed through the elimination bracket to become Tournament Champions. The team also competed in the Skills Division where they were the top scoring team (raising them to no. 1 in skills for the State Middle School Division). Michael and Jeffrey brought home the Tournament Champions, Robot Skills Champions, and Team Excellence trophies. Way to go team CMS Eagles!! 7th grade robotics team had another very successful competition this Saturday in Jonesboro. 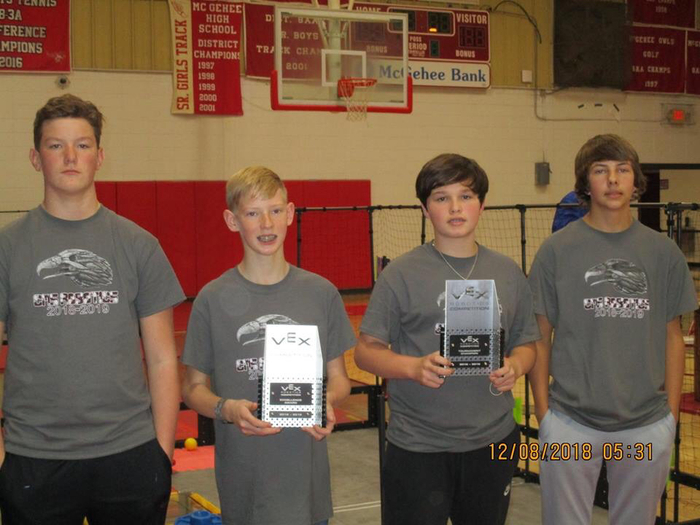 Tressa Richards, Reece Poe, Caleb Christy, and Blake Burford brought home 3 awards: they were the teamwork tournament champions, they won the skills award (this is their first time to win this award), and they won the Excellence Award. And they got to enjoy A LOT of snow!! By the time the tournament was over at 4:00, there was over an inch of snow covering everything! Project AWIN and Arkansas Rehabilitation Services will provide training at Crossett High School on Wednesday, February 20th from 5-7 p.m. 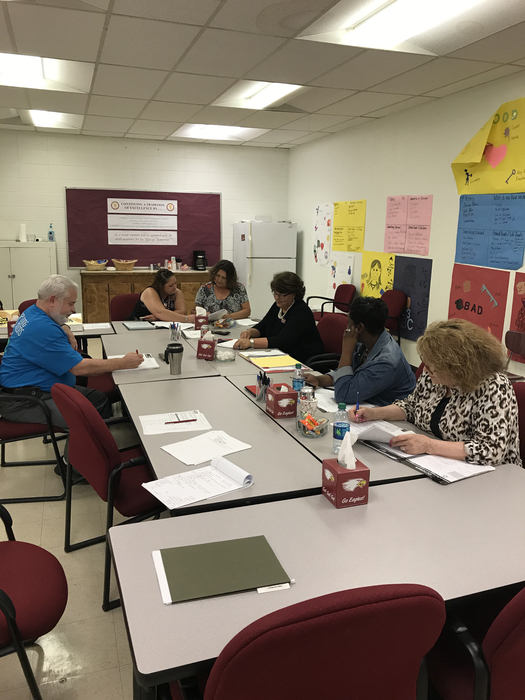 Currently, Crossett High School has implemented the OWL program for the 2018-2019 school year. The OWL program is a program that is funded by Arkansas Rehabilitation Services(ARS). Cynthia Bullard, a representative from ARS, visits Crossett High School twice every month to help with post secondary schools/ training options. 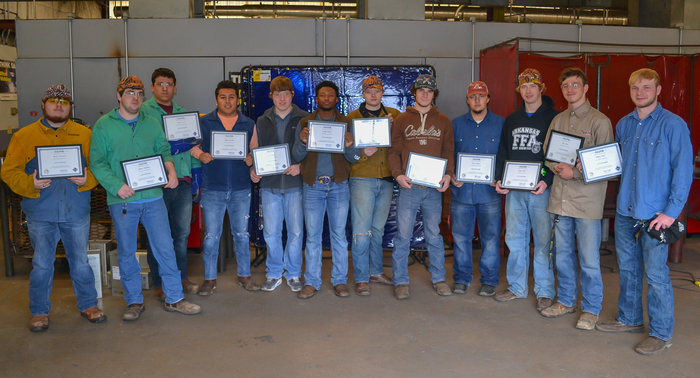 The first semester Crossett started out with 10 students in the program. Mrs. Culpepper’s students performed jobs in the media center, cafeteria and custodial work in the building. Mrs. O‘Neal’s students participated by cleaning in various classrooms throughout the building. Her students also participated in a recycling program. Both teachers have witnessed positive effects from the program with participating students. These students are loyal, punctual, and enjoy learning their jobs to perform all duties expected of them. Additionally, the OWL program has been a step in the right direction to promote independence of Special Education students for post secondary options after high school. Since, the students have received their first paycheck several have opened up bank accounts with the support of local banks. This will help them build more skills for balancing checkbooks, want versus need purchases, how to file taxes, and many more skills that are needed after high school. For those students that want to further their educations the OWL program will guide these very students into post high school programs. 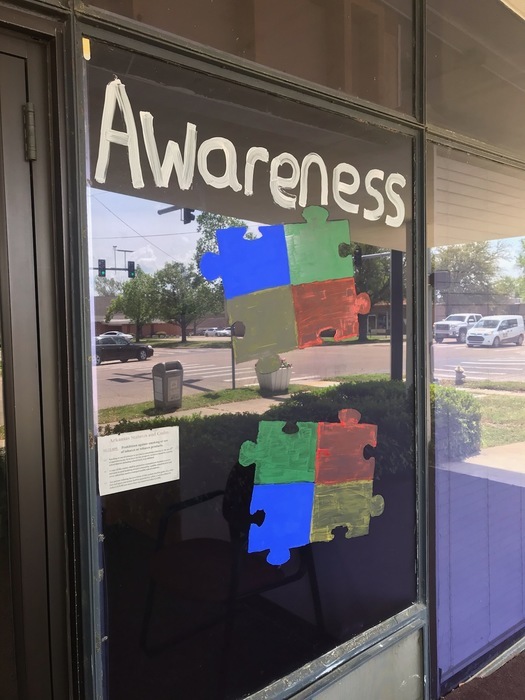 Crossett High School Special Education students established an entrepreneurship business with the help of art students. 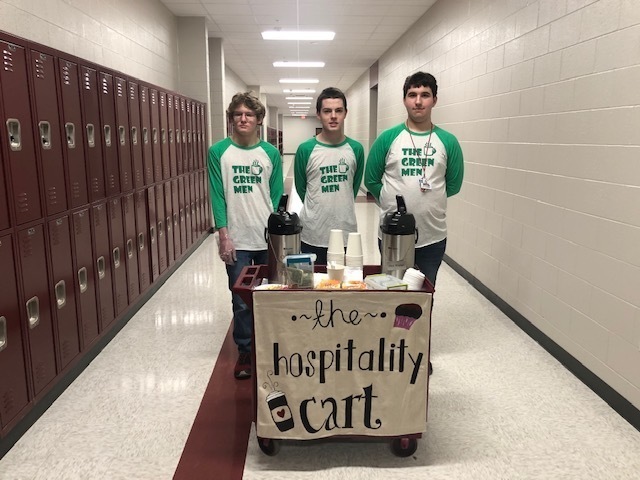 This business allows students to serve coffee/ hot chocolate from mobile carts (Hospitality Cart & Crossett Cafe Cart) around the school. These students are building confidence while learning to take turns, making eye contact with people, how to communicate with people, and how to count money. They are really enjoying selling coffee to the teachers and administrators in the building. Six of the students pushing carts around the school are calling themselves the “Green Men”, and it has stuck. You’ll see the carts on Wednesdays and the students really appreciate the staff that have supported this group. 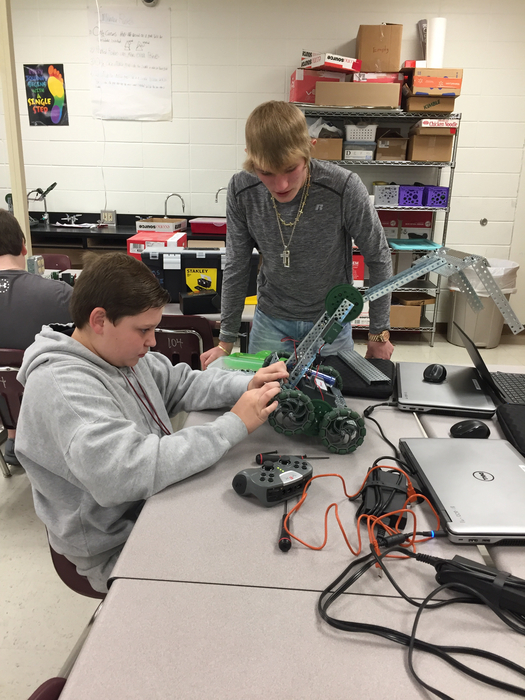 The OWL program has been a positive move for Crossett High School. The students have really improved their skills since the first day of starting the OWL program. Soon the students will participate in off campus opportunities. Several local businesses have shown interest in our students, because the OWL program actually funds work / training hours up to 20 hours per week. Our students have interests in working in the local fire department, Georgia Pacific, bowling alley and Daylight Donuts shop who has also decided to donate pastries to the carts this semester. 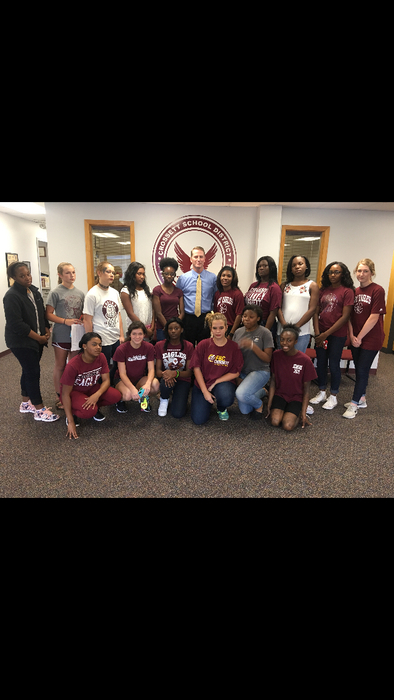 Finally, the OWL program is on its early legs here at Crossett High School and is really turning out to be a positive impact on the students and local community. 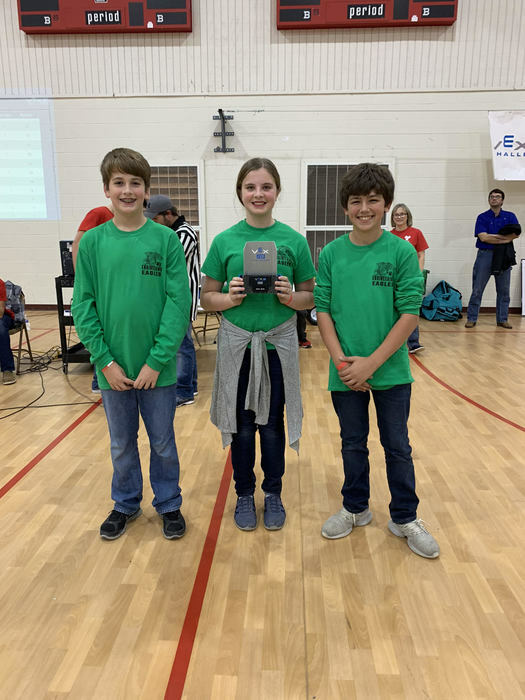 The Engineering Eagles 5th and 6th grade teams were paired together for teamwork finals in the recent robotics competition in Hope, AR and won 1st Place!! All three teams have qualified for the State and National competitions this spring. CMS students were evacuated from the building due to smoke in a classroom that resulted from a malfunction in a motor in the A/C unit. Everything has been checked and cleared by the Crossett Fire Department and students have returned to their classrooms. 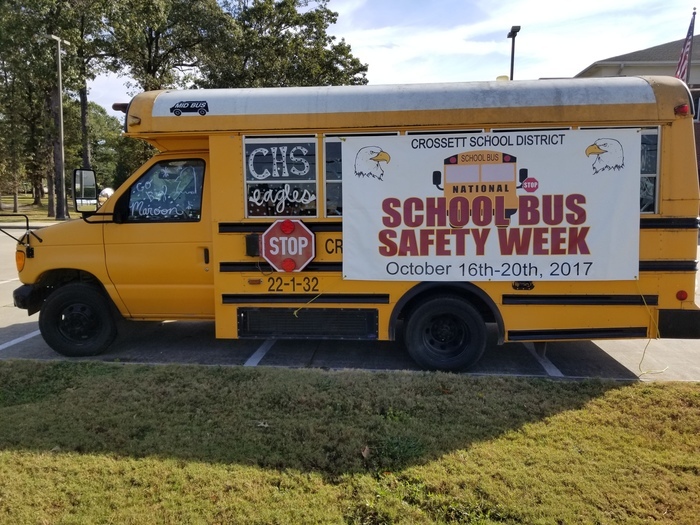 Thank you very much to the staff, the Crossett Fire Department and Police Department for their help in securing the safety of our students. The 6th grade Engineering Eagles, led by Melissa Martar, was awarded the Excellence Award at a recent robotics competition. This is the highest VEX award given for the engineering notebook, judges interview, and performance in teamwork and skills, and it reflects an overall excellent robotics program. January is Arkansas School Board Recognition Month. We want to recognize and thank our school board members for their service and dedication to our school district! Choice is Powerful! 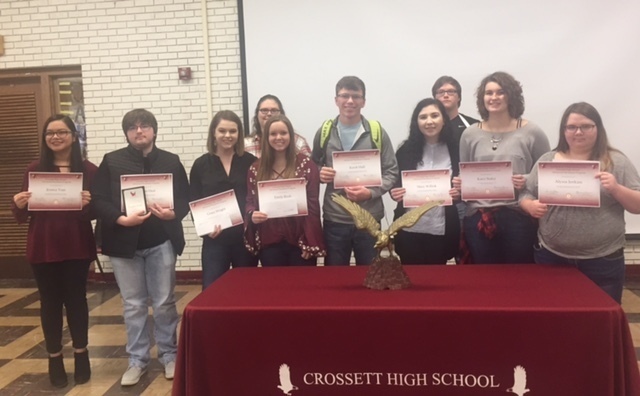 Apply now to become a Crossett Eagle! Parents of students not residing within the boundaries of Crossett School District, who would like for their children to attend Crossett Schools in 2019-2020, under Arkansas Public School Choice Act, can obtain a formal application online at www.crossettschools.org under the District Forms link or from the Administration Building located at 219 Main Street, Crossett. The deadline for applications is May 1, 2019. For questions concerning School Choice, please call 870-364-3112. 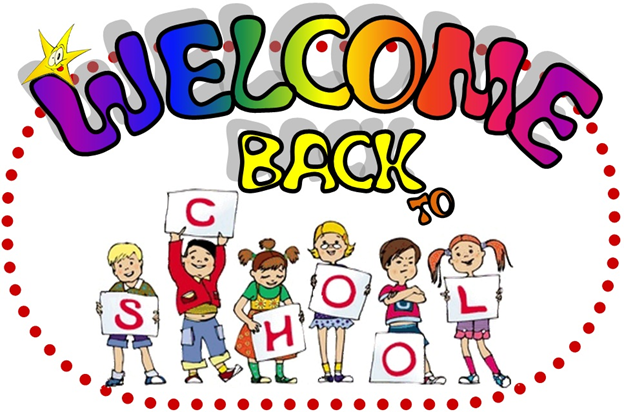 Students will return tomorrow, Tuesday, January 8th, which begins the 3rd 9 weeks. 2nd 9 weeks Report Cards will be sent home on Wednesday, January 9th. Happy New Year! Crossett Parents/Students/Faculty & Staff: We will be making up the day we missed in August (21st) on Monday, February 18, 2019, which is Presidents' Day. Please spread the word! Crossett Schools will be dismissed for Christmas Break December 24th-January 4th. Students will also be out of school on Monday, January 7th and will return on Tuesday, January 8th. We wish you a Merry Christmas and a Happy New Year! 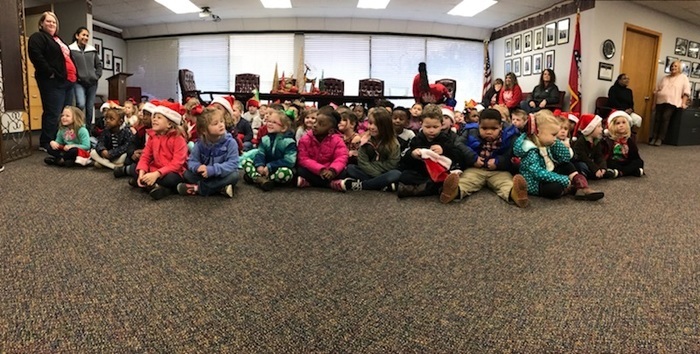 We thoroughly enjoyed being visited by Crossett Pre-K 4 students today! They sang songs for us and wished us a Merry Christmas! Congratulations to Jaylah Gaston, Lexie Cameron and Anna Rice, CHS Seniors who were honored today as Jr. Rotarians of the Crossett Rotary Club. 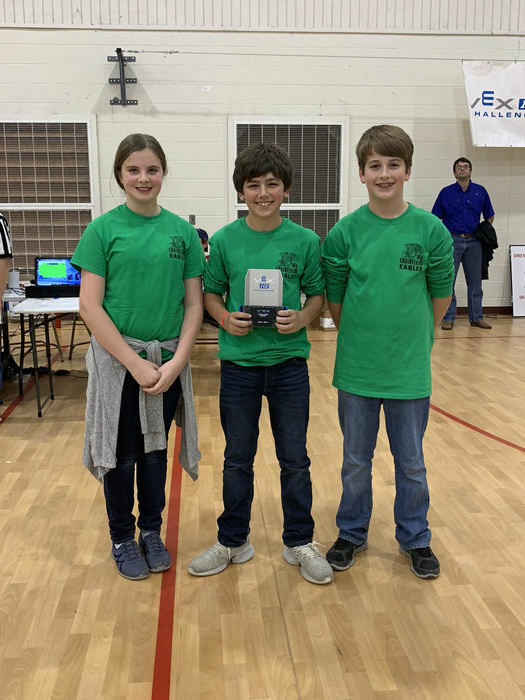 The 7th/8th grade CMS Robotic Eagles won Tournament Champions and The Excellence Award at the Delta Showdown last Saturday in McGehee. 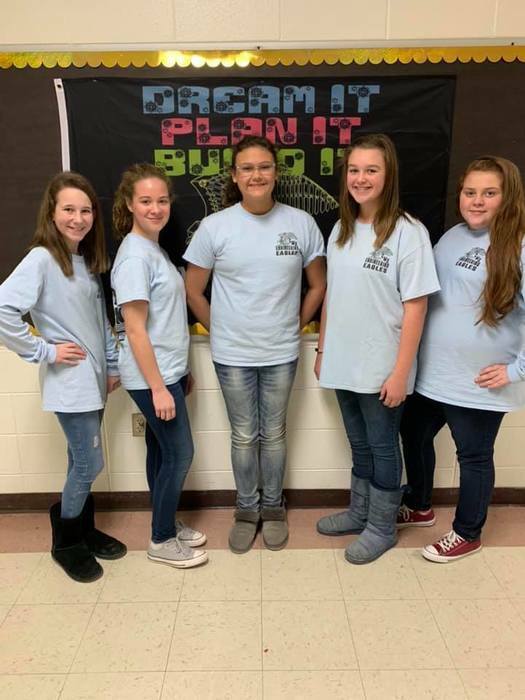 CMS Eagles partnered with the team from Sylvan Hills High School (first picture) in the Elimination Rounds to win the tournament. There were 15 teams from various High Schools and Middle Schools from around the state. The CMS Eagles ranked 3 out of 15 after the Qualifying Rounds. The team is now qualified for the State Competition in March. The Excellence Award is given to teams that interview well, have a good engineering notebook, perform well in matches, help other teams, have an interesting design, and impress the judges overall. 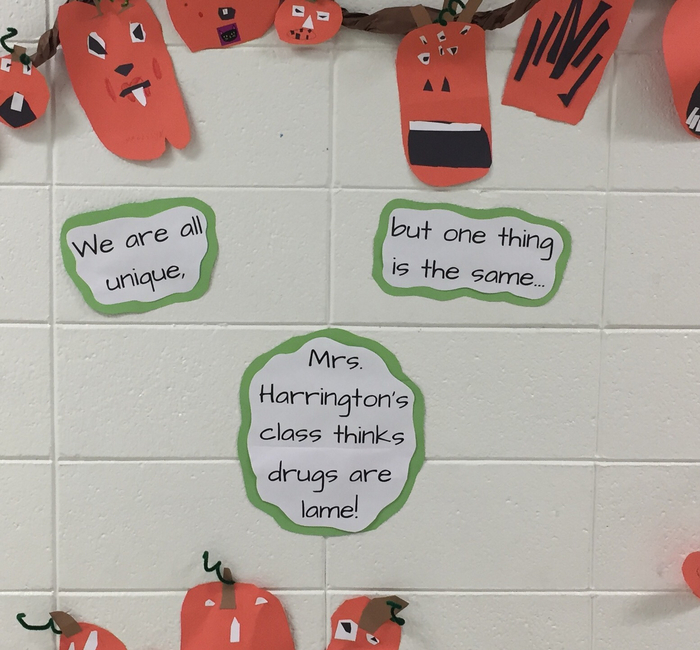 Students in the PreK PLTW program at Crossett Learning Center are exploring characteristics of living and nonliving things. By examining habitats, students are developing an understanding of what living things need in order to survive. They use the design process to sketch, build, and test an animal’s shelter, then reflect on their design. Students in Ms. Jones' classroom are learning about the engineering process by drawing a design for their birdhouse and then working together to build the birdhouse. The Open House for both the old and new CHS buildings will be held next Saturday, December 15th, from 12-4 p.m.
Crossett School District will be dismissed November 19th-23rd for Thanksgiving Break! 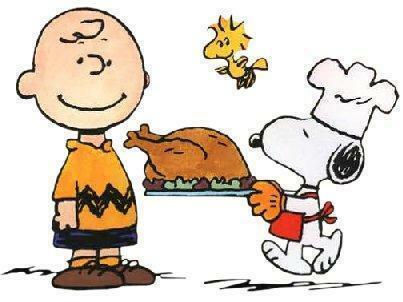 We hope everyone has a safe and happy holiday. Roads are clear and school will be in session today. Drive safely. 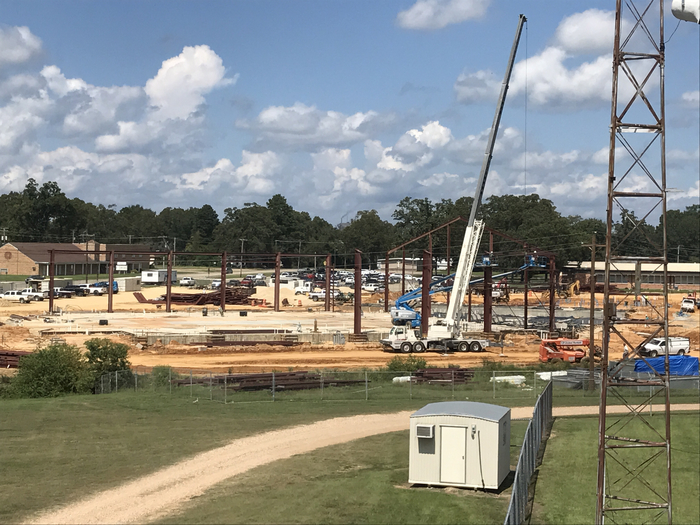 Panoramic view of the new Crossett Eagles Arena! 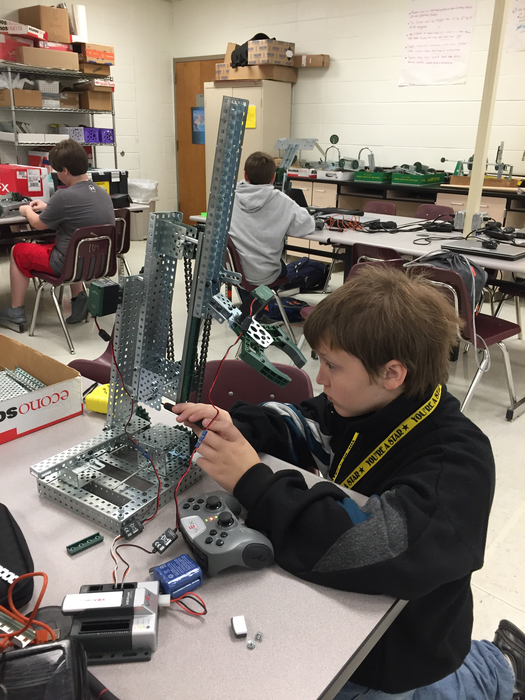 The Engineering Eagles Robotics Team, led by Melissa Martar, had their first competition recently. All 3 teams did really well! In teamwork, 7th grade came in 2nd, 6th grade came in 4th, and 5th grade came in 5th. In skills, 7th grade tied for 2nd place. The 7th grade team won the Design Award and the Excellence Award, which is the highest award Vex gives out!! We are so proud of all three teams! They are off to a fantastic start! 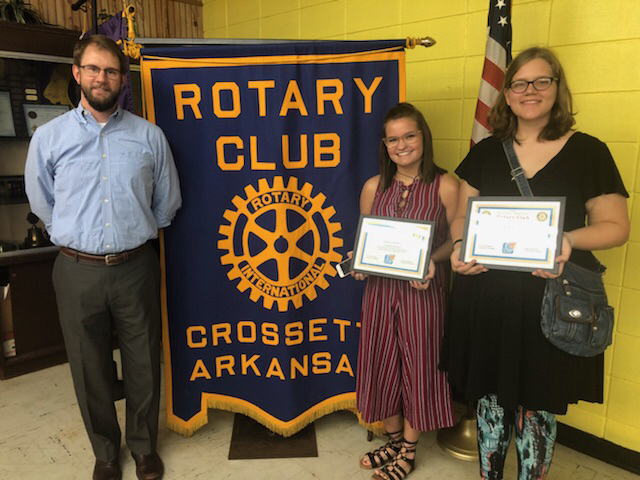 Congratulations to CHS Seniors Haley Myers and Felicity Fisher for being honored as Jr. Rotarians of the Rotary Club of Crossett! 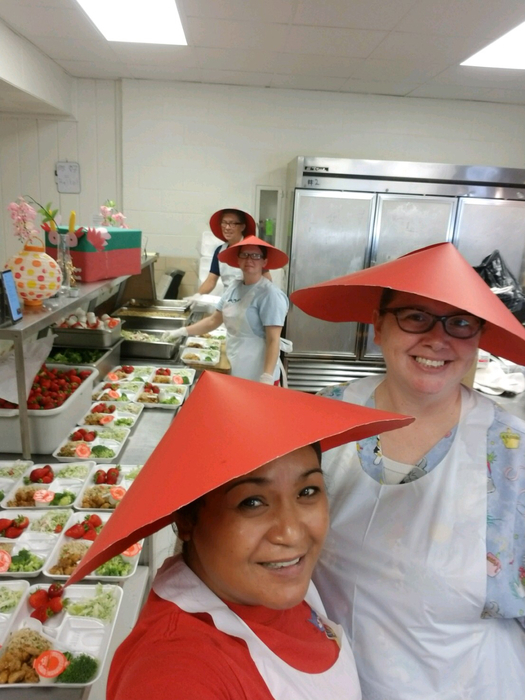 The CLC Food Service staff makes it a happy eating experience for their students when they come through the lunch line and see the staff dressed up to match the food they are serving!! This evening will be the last football game of the season for the junior and 7th grade Eagles! Come out and support them as they take on Hamburg at 5:30 p.m. Go Eagles! 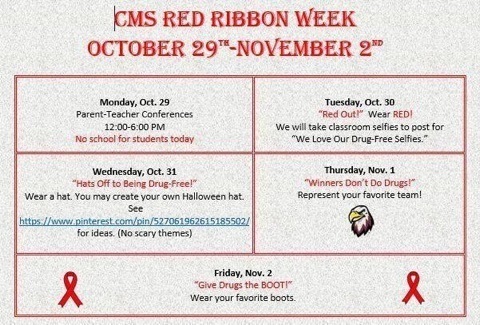 CMS Red Ribbon Week Themes Red Ribbon Week is October 29th-November 2nd! The Advanced Placement Awards Ceremony will be Thursday, Oct.18, at 1:30 p.m. in the CHS cafeteria. Students who earned a Qualifying Score on their 17-18 AP exam will be honored. Come out and support the Eagles tonight as they take on the Monticello Billies at home at 7:00 p.m. at Lynn Yarborough Field! Go Eagles!! 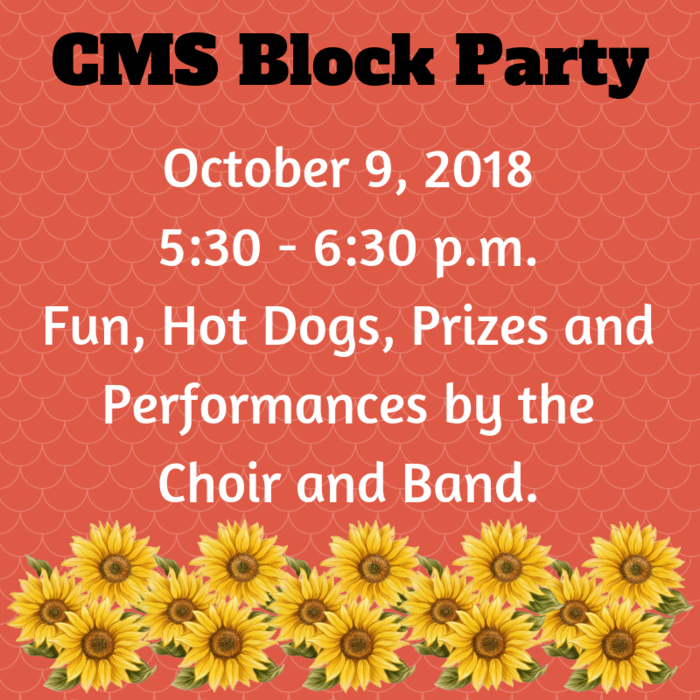 CMS Block Party this evening! There will be an Advanced Placement Awards Ceremony Thursday, October 18, 2018 at 1:30 p.m. in the CHS cafeteria to recognize the 17-18 students who earned Qualifying Scores (3 or better) on their AP spring exams. On Tuesday, October 9th from 5:00 p.m until 6:30 p.m., there will be a FAFSA Fill out Night at the CHS Library. Parents and their senior students are invited. Parents please bring your 2017 Income Tax papers. Food will be provided. It will be come and go. Congratulations to CHS Seniors Bryce Moon and Bennett Holt who were honored as Jr. Rotarians of the Crossett Rotary Club today! 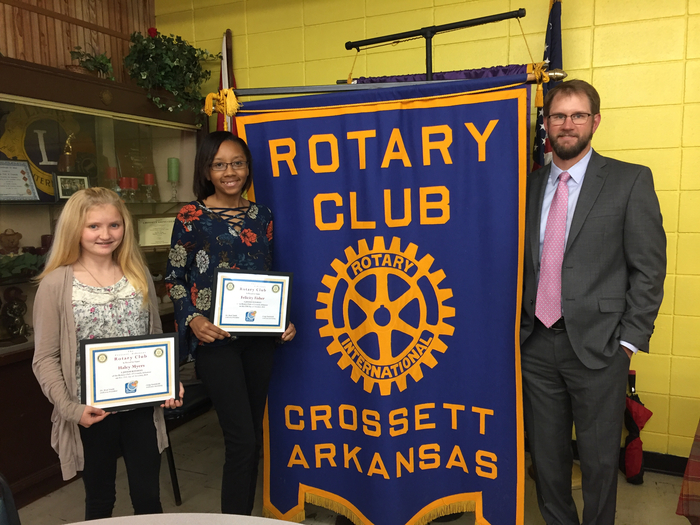 Congratulations to CHS Seniors Jayla Myers and Sydney Watkins who were honored as Jr. Rotarians of the Crossett Rotary Club on September 20! CES students perform for the Education Alliance Banquet tonight on instruments funded by a grant from the foundation. Anna Brown, CES 4th grade teacher won a great door prize at the Education Alliance banquet tonight! 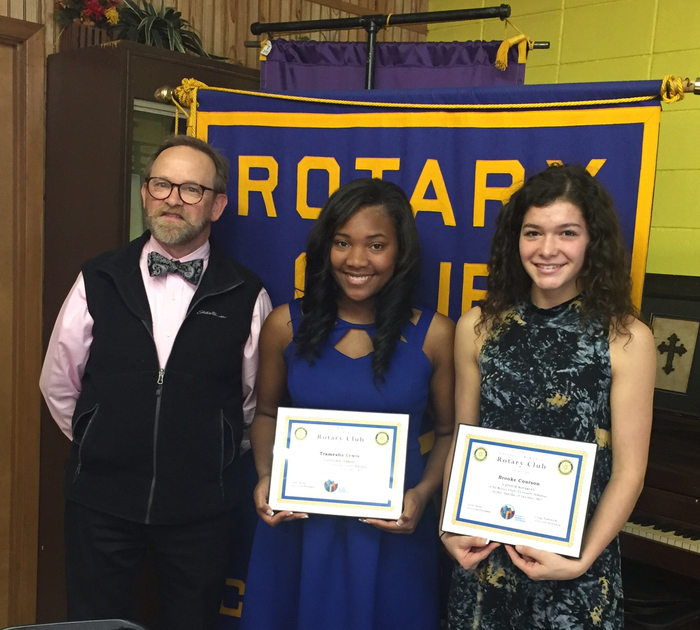 Congratulations to CHS Seniors Elizabeth Smith and Sunni Lee who were honored as Jr. Rotarians of the Crossett Rotary Club this week! The date for Parent/Teacher Conferences has been changed to Monday, October 29th. Students will be out this day, with Parent/Teacher conferences being held from 12-6 p.m. Students WILL be in school on Monday, October 22nd. Congratulations to CHS Seniors Karis Staley and Abbey Austin who were honored as Jr. Rotarians of the Crossett Rotary Club today! 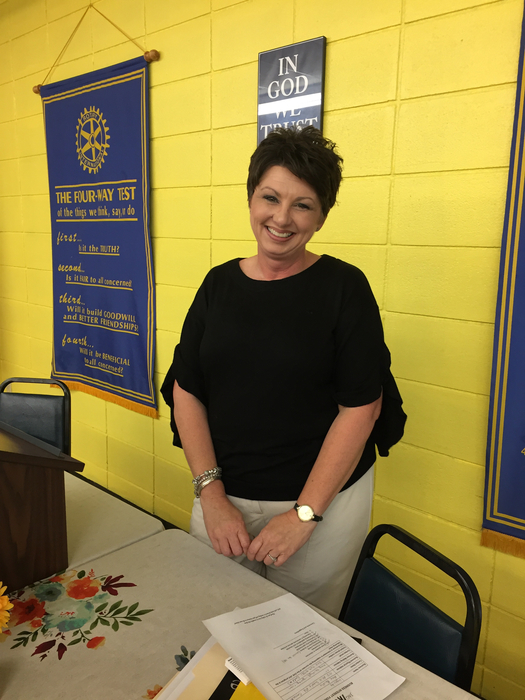 Kristi Clanton, CHS JAG (Jobs for AR Graduates) Specialist was the guest speaker today for the Crossett Rotary Club meeting. Great presentation Ms. Clanton!! Crossett High School welcomed Brooke Clanton to speak to students today about her job as a Program Manager for the Arkansas Agriculture Department. Brooke is pictured with her mother, Kristy Clanton, a CTE teacher at Crossett High School and CTE teacher Sammy Cox. . Ms. Clanton’s presentation is part of the focus of CHS to provide students with information about different careers so that they can begin to research and develop plans to pursue the career of their choice once they complete graduation. 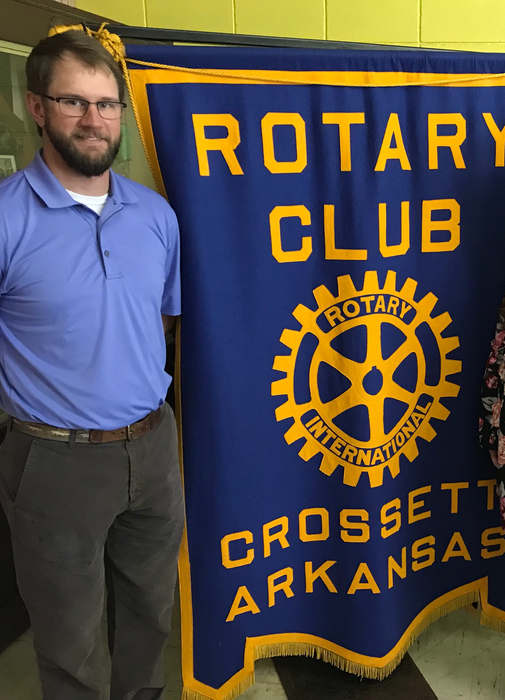 Congratulations to Dr. Brad Walsh, former CSD graduate, who is currently serving as the President of the Crossett Rotary Club! Congratulations to CHS Seniors Kelsey Babb and Daley Chavis who were honored today as Jr. Rotarians of the Crossett Rotary Club!! All power to our buildings has been restored and school will be open tomorrow. Thank you to all those who are working tirelessly to restore power to our community. We anticipate power being restored in all buildings this evening and we plan to open school at normal hours. If restoration does not occur as planned we will send out notification as soon as possible. Due to the power outage Crossett School District will be closed Tuesday, August 21, 2018. 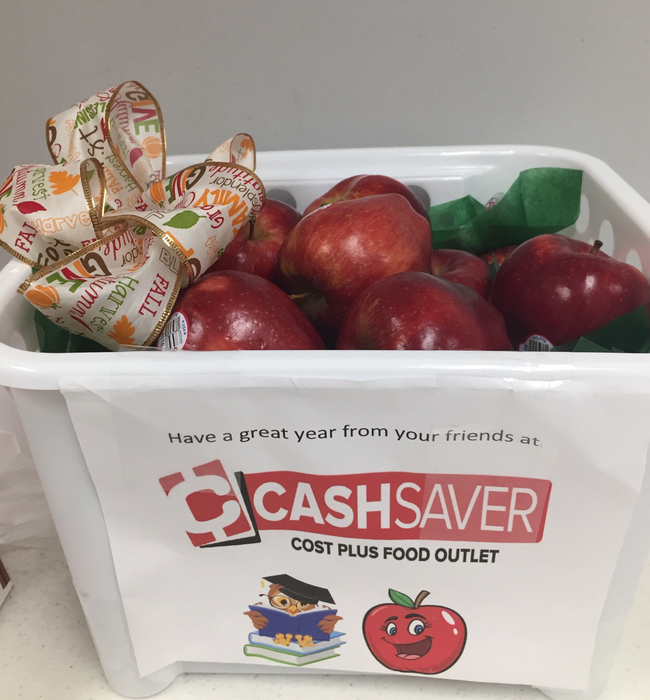 Thank you to Cash Saver for the delicious apples shared with our staff today. We appreciate your support! We are excited to welcome our students to their first day of school tomorrow, August 13, 2018. We have been eagerly planning and preparing for a great year!!! Welcome Back! It is always a great day when the CSD staff comes together to enjoy lunch that is provided by the members of First Baptist Church. Thank you for the delicious food, words of welcome, and your prayers. Starting Monday, July 30th the Transportation Secretary will start assigning bus routes for anyone that had a change of address or is new to the district and is unsure of your child's new bus route. Please come by the Transportation Office to fill out the Student Bus Registration Form. If you have not moved and your child will be riding the same bus, then you will NOT need to come by the office; everything will remain the same. The office hours for the Transportation Secretary is 10 AM to 5 PM with a lunch break from 12 PM to 1 PM. The office is located at 1100 Main Street in between the City Auditorium and Crossett Middle School. This picture is another great reflection of the kindness and generosity of our community. Timberline Federal Credit Union hosts a Stuff a Bus with school supplies each year in front of their building and the donation of money and school supplies has been great this year. Thank you very much to everyone who donated to this effort to support the students of Crossett School District! We are so thankful for how our community supports our school system. Tonight FNBC treated our new teachers and their buddy teacher to a delicious meal, door prizes and special offers of support. Thank you FNBC employees for your hospitality and kindness! In the Summit Learning Platform for grades 7-9, students set goals for school, college and careers and beyond and learn how to connect each goal to their daily actions. CMS and CHS teachers are attending their last day of Summit Learning training today in North Little Rock. 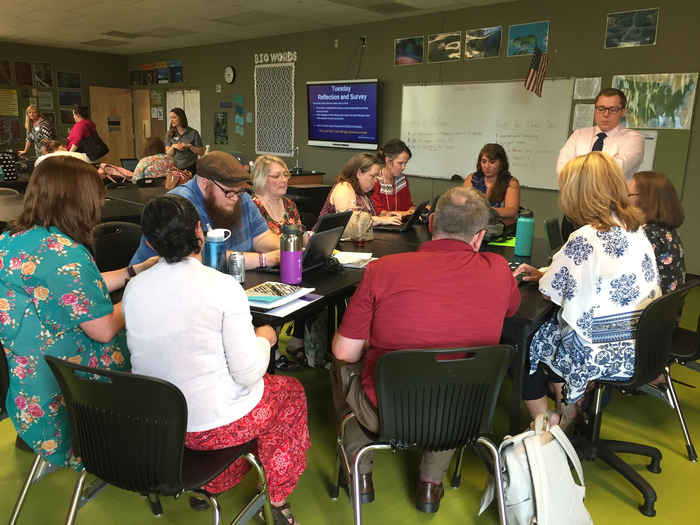 It has been an intense and challenging week of training and the teachers and administrators are excited about bringing this personalized learning to our students in grades 7-9. Building Professional Development Plans for 2018-2019 can be found in the Documents link at the bottom of the CSD web page. New teachers to the District will need to complete an Individual PD Plan, register for PD Sessions through ESC Works and submit a copy to their Building Principal for approval. For additional help, please contact your Building Principal or Barbara Garner, Asst. Superintendent at 870-364-3112. There will be a District Title I meeting at the TIPS Center, Wednesday, May 23 at 1 p.m. to provide information to parents of participating children about the Title I Program and how to be involved in their child's education. 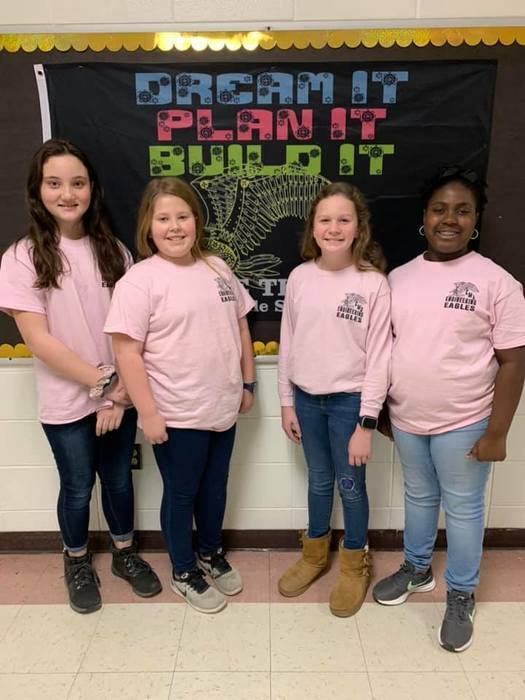 Crossett Middle School (Charre Todd) is offering a STEM Camp June 18-22, 2018 for current 3rd-5th grade students from 8 to 11 a.m. and for current 6th-8th grade students from 12:00 to 3:oo p.m. Cost per student is $75.00. For registration information contact CES (364-6521) or CMS (364-4712). You may also contact charre.todd@crossettschools.org for information. 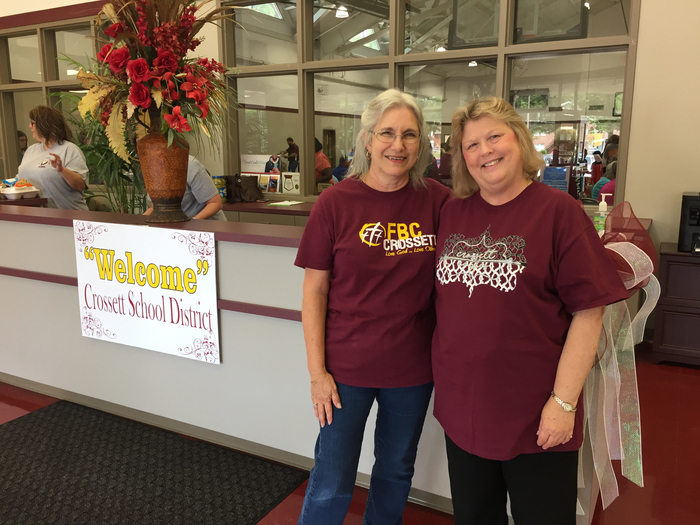 Crossett School District cordially invites you to a Reception, Tuesday, May 22 at the Hugh Willis Administration Building, 219 Main Street from 3:30-5:00 p.m. to honor our Retirees, Teachers of the Year and Classified Employees of the Year. Congratulations to Veronica Robinson, CES Principal, who recently graduated with an Ed. 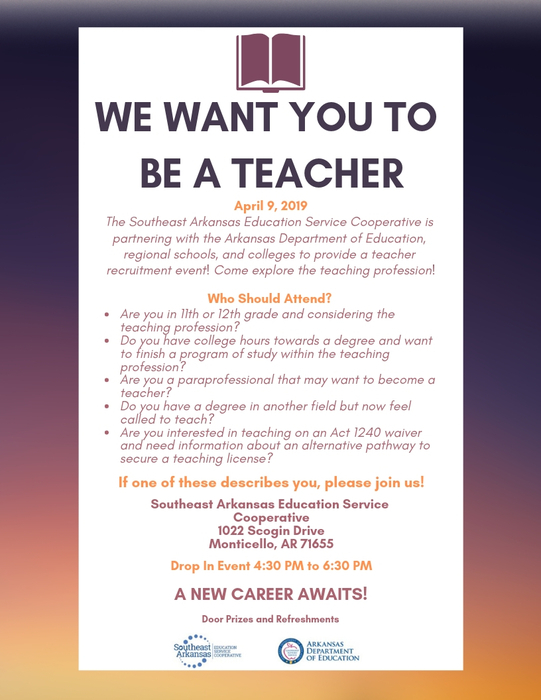 Specialist degree in Curriculum and Instruction from Arkansas State University! Senior Girls Track - State Runner Ups! 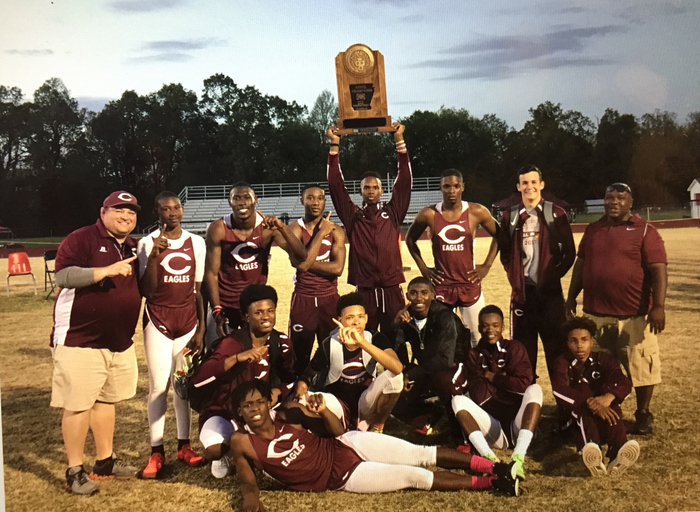 Congratulations to the Senior Boys Track Team for winning the 4A State Track & Field Championship!! 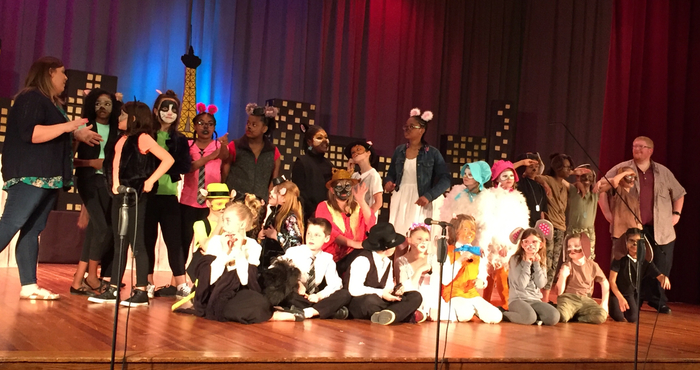 CES Show Choir, led by music teachers Josh Wayne and Kelly Savage, presented a super performance of the show Aristocats at the City Auditorium tonight! Thank you to the parents, grandparents, friends and community that attended. Your support is appreciated very much. 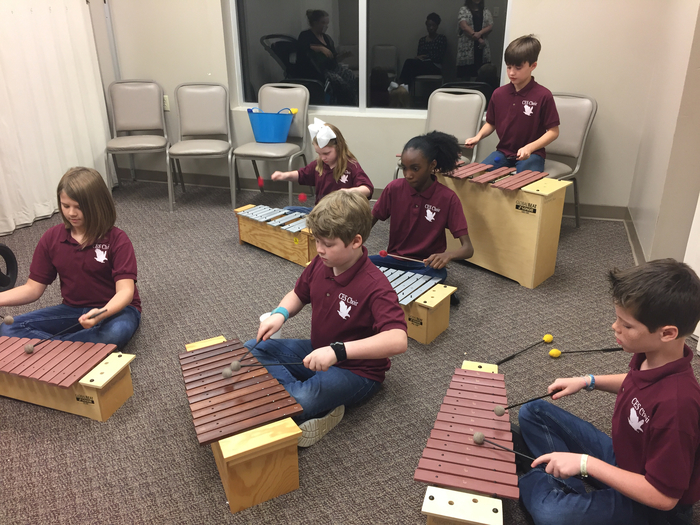 Crossett Middle School would like to thank the many parents, grandparents, friends and students that attended their Hour of the Arts program that was held on Thursday, April 19. Attendees had the pleasure of hearing the elementary choir sing the National Anthem. Also those attending were able to view different art and science projects along with hearing 5th-8th grade choirs and 6th-8th grade bands perform. Others performing included the Cheerleaders and Juniorettes. Thank you for supporting our students and teachers and making the event a success! 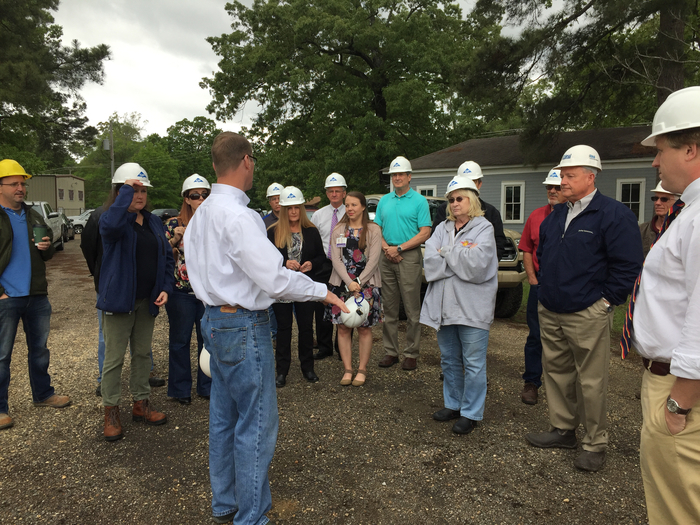 Rotary Club members enjoyed a guided tour today of the new CHS construction site. Excited and thankful for the new facility. 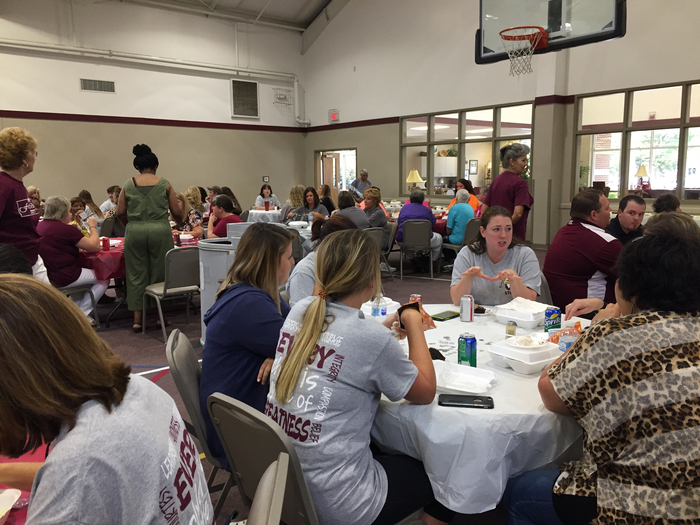 Thank you to First National Bank of Crossett for providing grilled hamburger plates today for our Administrators and Administrative Professionals. We appreciate the support of FNBC and all the employees who cooked and delivered this great lunch for our staff. 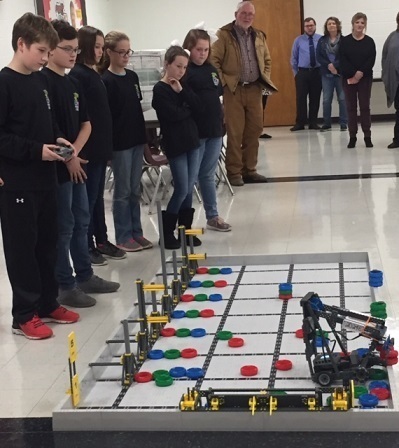 The Crossett Middle School Engineering Eagles Robotics Team (5th & 6th grade students ) provided the program for Rotary today and they did an exceptional job. They just returned from Council Bluffs, Iowa where they placed 16 out of 69 teams at the U.S. Create Open Competition. The team is coached by Melissa Martar. Congratulations to Ila Toon, CHS Senior, who was honored today as a Junior Rotarian of the Crossett Rotary Club! So excited today that CMS' VEX EDR Robotics team is competing at the 2018 CREATE U.S. Open Robotics Championship in Iowa! We wish them the best today! Bus riders at Crossett Elementary School, whose parents have been confirmed to be at home, will depart school at 11:15 a.m. to 11:30 a.m.
Due to a power outage affecting only Crossett Elementary School, we are cancelling classes only at Crossett Elementary School and parents may pick up their children beginning at 10 a.m. For students at Crossett Elementary School this will be AMI Day 2. For students who ride buses a follow-up announcement will be made as to their departure time. Any student that rides a bus and their parents cannot be confirmed to be at home or are not picked up by their parent, will stay at school with their teacher and will be taken home at the normal time at the end of the school day. Again, only Crossett Elementary School is affected. All other campuses will be open and run a normal schedule. Crossett School District will be open and buses will run at normal times. The Crossett School District plans to be open tomorrow. However, our forecast calls for 3-5 inches of rain overnight, which may be significant enough to cause some local flooding. The roads will be inspected in the early morning hours, and if they are adversely affected, the district will consider two options if needed. The first option will be a two-hour delayed start to school. If this occurs, pick up times for buses will be pushed back two hours to coincide with the delayed start of school. The second option would be to cancel classes and use our second AMI day. Again, Crossett Schools are planning to be open tomorrow, but we wanted to share these possibilities for planning purposes. Any announcement for a delayed start or cancellation will be made at approximately 6:00 a.m. If no announcement is made by 6:15 the district will be open at the regularly scheduled time. Volunteers are needed to work Project Graduation on May 18th from 10:00 p.m. to 4:00 a.m. We need people to work the games, security, food and check in/check out. If you cannot come that night but would still like to help, you can assist with fundraising (collecting prizes and donations), decorations or picking up food donations that day. To sign up you may contact Susanne Ballard at ballard@uamont.edu or pick up a form in the office at CHS. Registration for Pre-k will be April 2-6, 2018. Children must be 3-years-old by August 1 to enroll. Applications are available in the front office at Crossett Learning Center or may be printed from the website. Packets can be found on the District website in the Documents folder at the bottom of the page, then in the District Forms folder. We look forward to having your children in our Pre-k program. 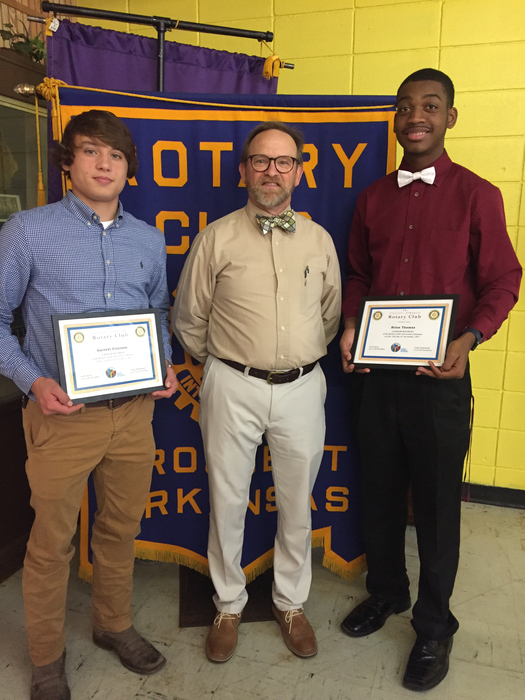 Congratulations to Cole Moss and Jareth Concannon for being selected as Jr. Rotarians of the Crossett Rotary Club! It is time for Kindergarten registration for the 2018-2019 school year! Registration packets can be found on the District website in the Documents folder at the bottom of the page, then the District Forms folder. Please bring your completed forms and required documents to the Crossett Learning Center the week of March 26-30. We look forward to having your children in our school district! School Choice Announcement The Crossett School District is accepting students under the Arkansas Public School Choice Act 560 of 2015 amended Ark. Code Ann. § 6-18-1901 et seq. The act went into effect March 20, 2015. Parents of students not residing within the boundaries of Crossett School District, who would like for their children to attend Crossett Schools under Arkansas Public School Choice Act, can obtain a formal application online at www.crossettschools.org under the Documents link or from the Superintendent's office located at 219 Main Street, Crossett, AR 71635. Applications will be accepted until May 1, 2018. Parents will be notified by July 1, 2018, of the decision to accept or deny their request. This afternoon we found a vague threat of violence towards our students written on a bathroom wall in the High School. The threat was not directed at any individual or individuals. Once the threat was found, we initiated the steps necessary to ensure our students’ safety. Within a matter of minutes, the appropriate authorities were notified, and a full investigation is being made. Law enforcement immediately responded and remained present to ensure student and staff safety and to assist with the investigation. Crossett School District will be open today and begin at the regular time. Roads were inspected this morning and because flooding was not found, buses will run their routes at their normal time. School will be open today. Please be safe as you travel. The Crossett School District plans to be open tomorrow. However, our forecast calls for 1-3 inches of rain overnight, which may be significant enough to cause some local flooding. The roads will be inspected in the early morning hours, and if they are adversely affected, the district will consider two options if needed. The first option will be a two-hour delayed start to school. If this occurs, pick up times for buses will be pushed back two hours to coincide with the delayed start of school. The second option would be to cancel classes and use our second AMI day. Again, Crossett Schools are planning to be open tomorrow, but we wanted to share these possibilities for planning purposes. Any announcement for a delayed start or cancelation will be made by 6:00 a.m. The Crossett School District will be open, and all buses will run their normal routes except for the White Station area, which will be slightly modified. The Crossett School District plans to be open tomorrow with possible minor modifications to bus routes. Areas that are still impacted are Ashley County Road 13 near Brushy Creek and White Station. These areas will be inspected in the morning, and if flooding is still an issue, these routes may be slightly modified. If any modifications cause a student not to be picked up by the bus and parents are unable to bring their child to school, we ask the parents to please contact the school. If a student is absent due to any bus route modifications, it will be excused with a parent note. There is a chance of rain overnight. However, the expected amounts are less than one-half inch. In the event we receive more than the expected rain and roads are adversely affected, the district will consider two options if needed. The first option will be a two-hour delayed start to school. If this occurs pick up times for buses will be pushed back two hours to coincide with the delayed start of school. The second option would be to cancel classes and use our second AMI day. Again, Crossett Schools are planning to be open tomorrow, but we wanted to share these possibilities for planning purposes. Any announcement for a delayed start or cancelation will be made by 6:00 a.m. Classes will be canceled today due to the numerous road closures, and we will utilize an Alternative Method of Instruction (AMI) day. Students will work on their AMI packet and return it to their teacher when they return to school. If the work is to be done online students will submit their work as prescribed by their teacher. If a student did not receive their AMI packet or cannot access the packet, they will not be adversely affected. They will be allowed to make up their work when they return to school. If you must be on the roads, please drive with extreme caution. The Crossett School District has been approved for an Alternative Method of Instruction (AMI). Arkansas Act 862 of 2017 allows a public school district and open-enrollment public charter school to develop a plan for alternative methods of instruction to be used on days when the superintendent closes school due to exceptional or emergency circumstances. These circumstances might be snow, flooding, widespread illnesses, or other occurrences. During these days, students and families will be notified to work on AMI lessons. If the superintendent declares an AMI day, students will work on their AMI packet and return it to their teacher when they return to school. If the work is to be done online students will submit their work as prescribed by their teacher. If a student did not receive their AMI packet or cannot access the packet they will not be adversely affected. They will be allowed to make up their work when they return to school. AMI course work was delivered today to our students. K-4th grade students AMI was sent home in the eagle folders. 4th-8th grade can complete their AMI online. Visit the CMS website for directions. CHS students were sent paperwork home today as well. Students who were absent or did not receive an AMI packet or are having trouble accessing them will be allowed to complete them when they return to school. All others should complete them as instructed. The weather forecast for tonight calls for several inches of rain, which could create flooding conditions overnight. We will continue to monitor the weather, and if flooding occurs, which causes cancellation of school we will use an Alternate Method of Instruction (AMI) day. Any announcement will be made through our normal course of notifying parents and community. Please be safe if you must travel. NEWS RELEASE OFFICE OF MEDIA SERVICES UNIVERSITY OF ARKANSAS AT MONTICELLO Students from Crossett and Hamburg High Schools recently received core curriculum certification by the National Center for Construction Education & Research (NCCER) after completing a series of welding classes at the UAM College of Technology-Crossett. Students completing the program received concurrent high school and college credit. NCCER certification means the students will be placed on a national registry used by employers to verify training of individuals applying for employment with their companies. 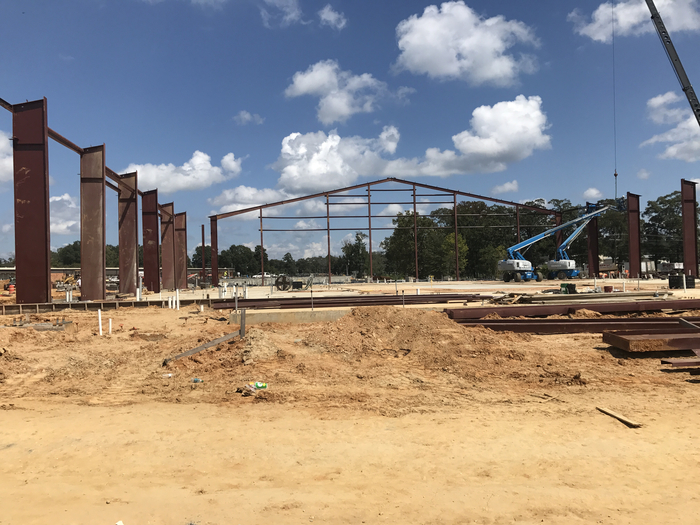 "The American Welding Society did a study that showed the average age of welders today is 58," said Donnie Dubose, a welding instructor at UAM COT-Crossett. "Job availability in welding is at an all-time high. There is an employment need of over 300,000 welders with no end in sight." According to Dubose, NCCER offers certification at multiple levels. Students must complete core skills before they are issued an NCCER card and certificate. Additional levels of certification may also be earned. "NCCER certification may also give students a higher entrance level wage," Dubose explained. "Many companies are using NCCER as their training program and certifying in advance will give these students an advantage." Students from Crossett High School participating in the program are Jareth Concannon, Hayden Matthews, Trenton Haen, Adolfo Gonzalez, Dillion Barnett, Joseph Monroe, Logan Black, Matthew Barnett, Taylor Thurman, Mitchell Cooley and Kyler Duncan. Hamburg students are Garret Ogletree, Logan Barner, Tyler Smith, Ben Wood and Dustin Snow. For more information, contact Dr. David Streeter, director of student services at the UAM COT-Crossett, at (870) 364-6414. ACT Test for all 11th graders at CHS-- On Tuesday, February 27, the State of Arkansas will offer the ACT test at no charge, and the scores will be reportable to colleges. Tips for test-takers: Get a good night's sleep, eat a good breakfast, bring snacks for break time. Bring two #2 pencils. Questions? See Mr. Sasser, CHS guidance counselor. We want to inform you of an email that was addressed and sent to another school in the state, which was threatening and disturbing. 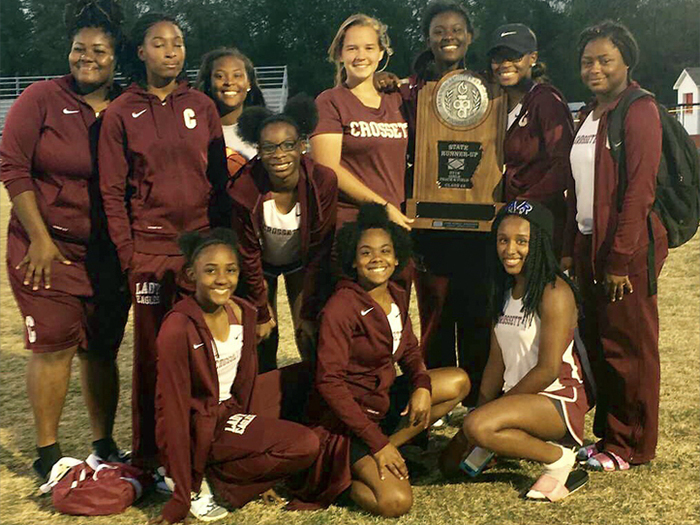 The email was addressed specifically to another school in the state, not to Crossett School District, but we did receive a copy of the email. The district that received the original email has contacted the local, state and federal authorities. We have also contacted the Crossett Police Department out of an abundance of caution. Again, this email was not addressed to the Crossett School District, but rather another district in the state. Law enforcement is continuing to investigate this situation, and as always, we will remain vigilant and take all steps necessary to protect our students and staff. 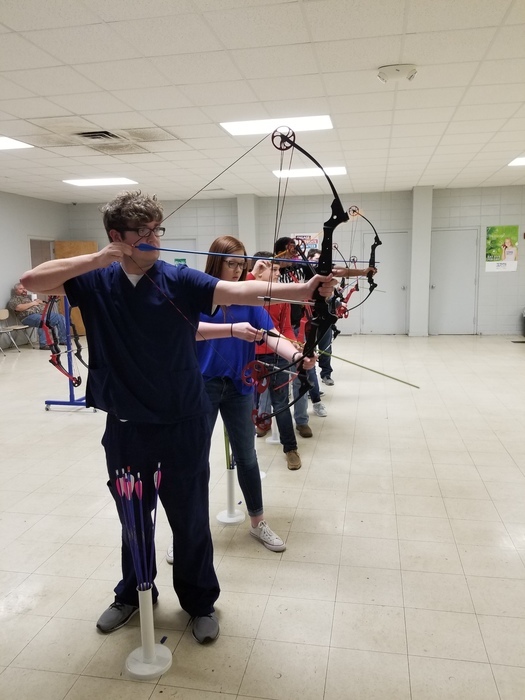 Congratulations to the CHS Archery Team which will be attending the State Tournament for their 2nd place win at the Regionals Tournament this past weekend!! The CHS Archery Team will be competing at the Regionals Tournament Feb. 10, 2018 at Hamburg for the chance of moving on to State. They have been practicing at minimum twice a week, and as of late have been practicing 3-4 times per week. Many of the students involved had never shot a bow or never used a bow without sights. They have improved greatly over the past few months. The competition involves shooting at lengths of 10 meters and 15 meters. At each length the students shoot once to practice, and then shoot 3 'ends' that are scored. The top score possible per round is 50. To advance to State Competition a team must place 1st, 2nd, or 3rd. Crossett School District would like to extend its sincere gratitude to Georgia Pacific for the generous contribution of $27,500 to our District. This gift will have a major impact in providing financial support for different educational programs involving our students and staff. The continued commitment of Georgia Pacific to support our District is appreciated very much. Please take time to download our newest CSD app from the Google Play store and the iTunes App store! School will be in session Monday, February 19, President's Day, due to days missed because of inclement weather. Students in K-6 and their parents have access to numerous math resources through the Think Central website which connects to the District's Go Math program. Each student in K-6 has access to this website at school and at home. The link is https://www-k6.thinkcentral.com and login information was sent home to parents before the Christmas break. Please contact your child's math teacher for additional help. 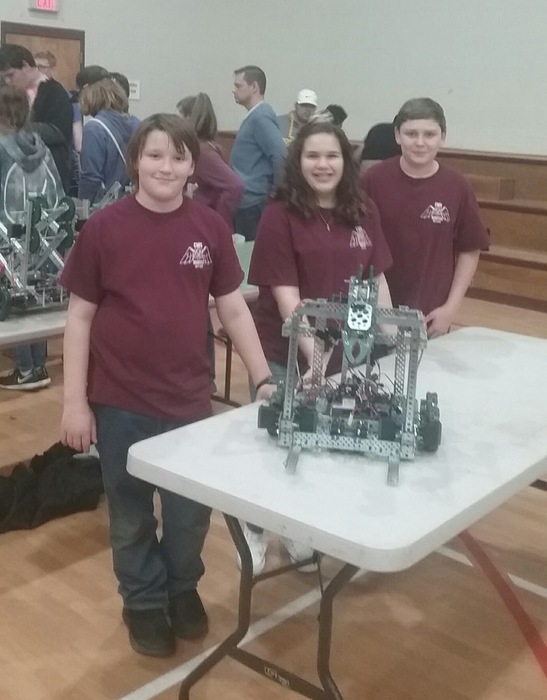 CMS Robotics Teams excelled with a GREAT performance at the UAM Robotics Competition January 20 in Monticello. The teams earned 1st (8th grade team) and 2nd place (GT Team). Congratulations to the students and coaches! Crossett Schools will be in session Friday, Jan. 19, and will begin at the normal time. School will be CLOSED Thursday, January 18. Too many roads continue to have ice on them and considered unsafe. Although the main roads are mostly clear, many secondary roads still have icy and hazardous conditions. Therefore Crossett School District will cancel classes on Wednesday, January 17, 2018. The games tonight against Lakeside have been canceled. Due to inclement weather, Crossett School District has canceled classes for Tuesday, January 16th, 2018. CSD will continue to monitor the weather and will announce by 5 am, Tuesday morning, if school will be in session, canceled or delayed. We appreciate your patience as we make this decision. Information about possible school closing will be announced on Channel 7 & 10; by our local radio station and will be posted on our FB and website. The decision about school closing has not been made yet. Due to inclement weather Friday, January 12., Crossett School District will begin 2 hours later today. Buses will run on this 2 hour delayed schedule. 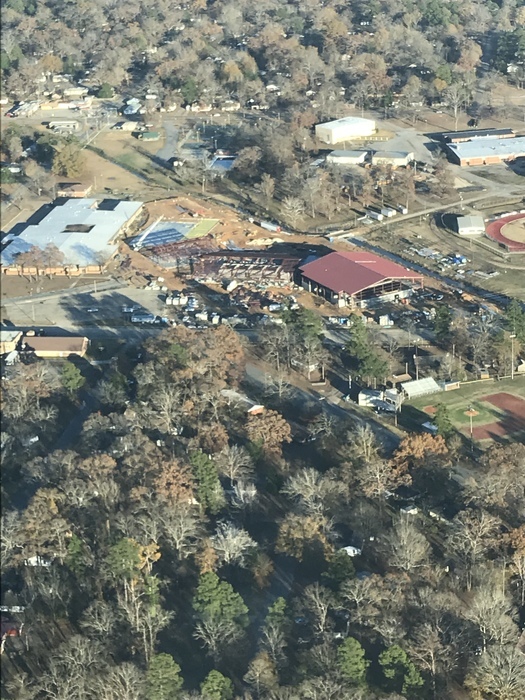 View of the new Crossett High School from 1200 feet above. 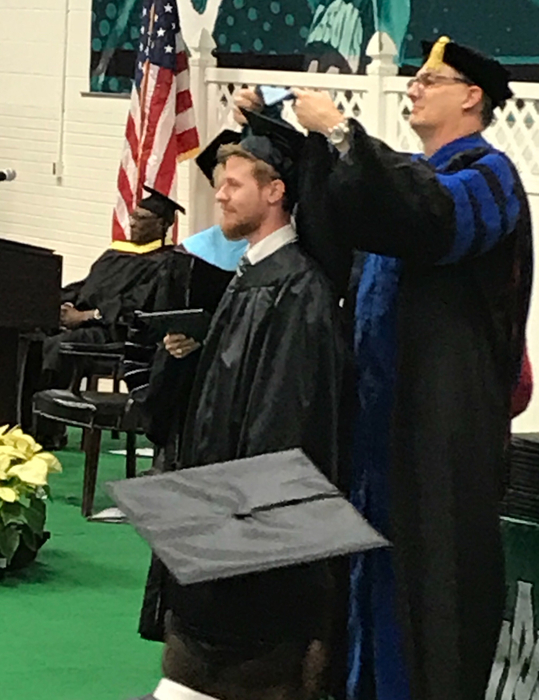 Congratulations to Kevin Strunk and Aaron Jones, CSD employees who were awarded their Master's Degree from UAM this weekend! Mrs. Todd's Robotics Team was 7 out of 18 in qualifying and made it to the finals again and came in 2nd at Jonesboro. Ciongrats to both teams. We are super proud of their efforts! At Jonesbiro today Melissa Martar's GT Robotics Team won 1st place in teamwork and won the Design Award which qualifies them for state competition! Very proud of our students that participated in the State Special Olympics Bowling Tournament in Little Rock. 15 students came home with 12 GOLD, 1 SILVER, and 2 BRONZE medals!!!!! Congratulations to the students who were honored at the recent Advanced Placement Awards ceremony held at CHS, for the Qualifying Scores they earned on their 2016-17 AP exams. Students in Ms. Burkett's and Mrs. Jones' classroom are using technology in their construction of inclined planes in their Project Lead the Way science class. 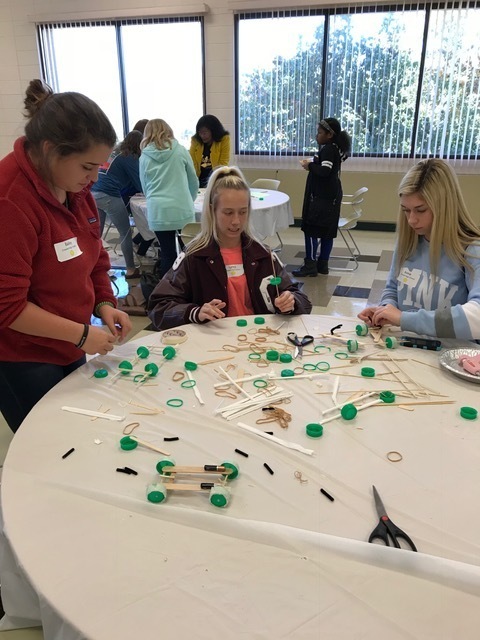 The program empowers students to adopt a design-thinking mindset through compelling activities, projects, and problems that build upon each other and relate to the world around them. 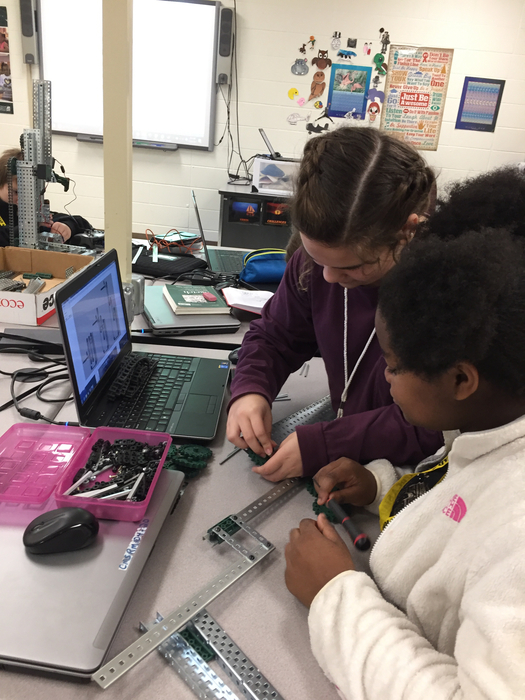 And as students engage in hands-on activities in computer science and engineering, they become creative, collaborative problem solvers ready to take on any challenge. 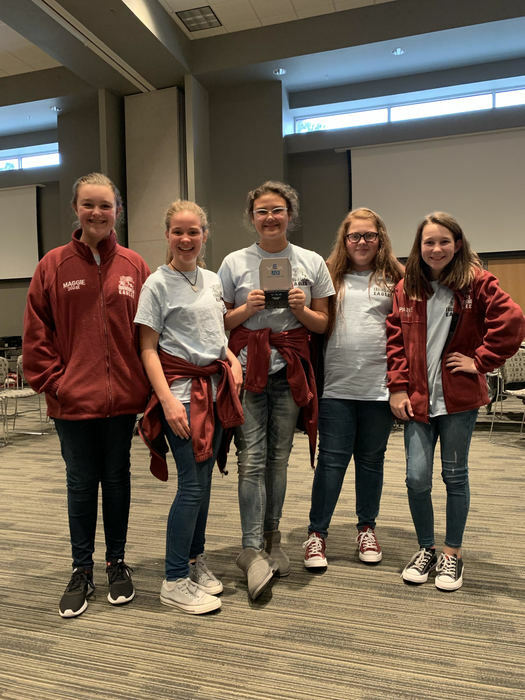 Congratulations to the 8th grade Robotics Team, led by Charre Todd, for placing 2nd out of 21 teams in the Qualifying rounds at UALR on Saturday. The team won 6, lost 1, and tied 1 match. Very proud of our students' achievement. 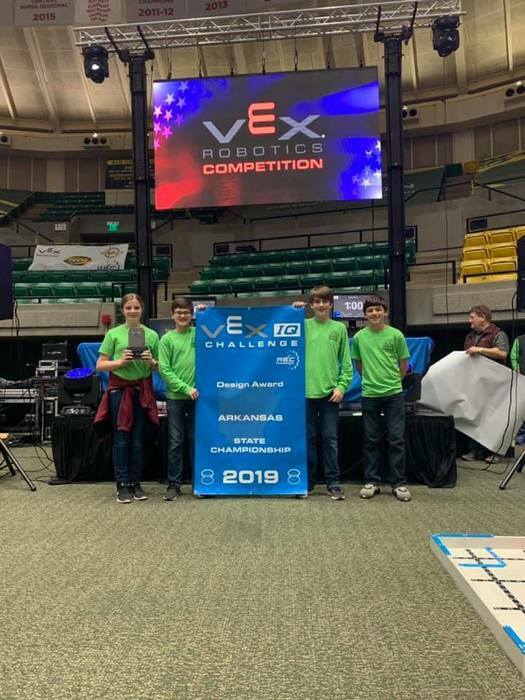 We want to share our awesome news with all of you...CMS' 5th and 6th grade robotics team won 1st place at their first Vex IQ tournament held at UALR! They scored a total of 153 points in the teamwork alliance matches...2nd place was 136! We are extremely proud of them! 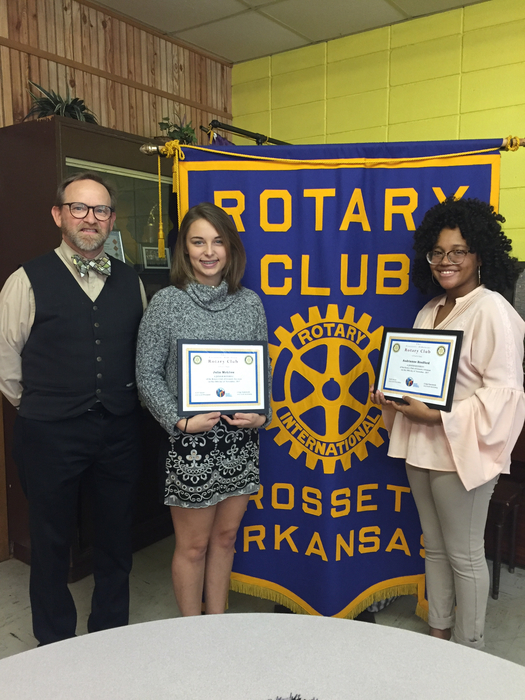 Congratulations to Julia McGhee and Audrianne Bradford, CHS Seniors, honored as Jr . Rotarians of the Crossett Rotary Club. 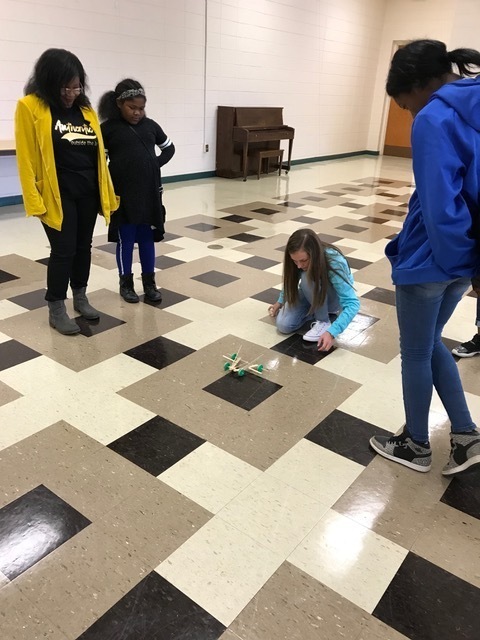 CMS's Robotics Team, led by PLTW teacher Charre Todd, participated in their first robotics competition in El Dorado this past weekend. Very proud that they were ranked as number 9 out of 20 teams!! A couple more pics of our CHS girls from the UAM STEM Conference today. Very proud of our CHS girls and their teachers who attended the STEM Girls Rock! Conference at UAM today! 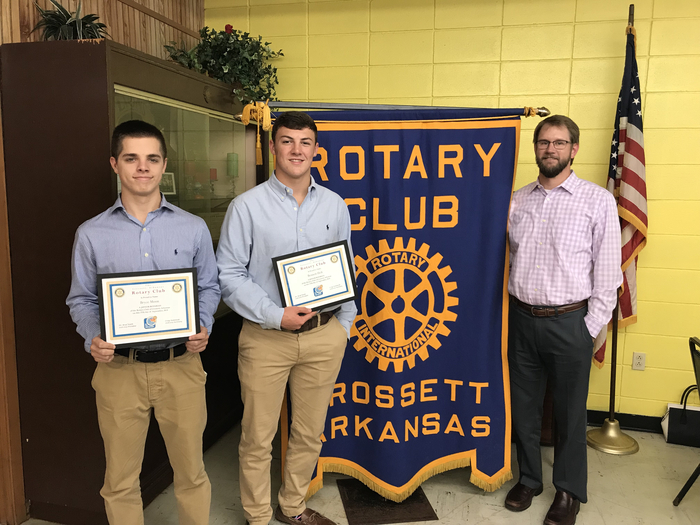 Crossett School District will hold a Public Meeting at the Crossett Learning Center to present the Facilities Master Plan and receive comments regarding the plan on Monday, November 13, 2017 at 5:30 p.m.
Congratulations to Garrett Courson and Brian Thomas, CHS Seniors honored as Jr. Rotarians of the Crossett Rotary Club. 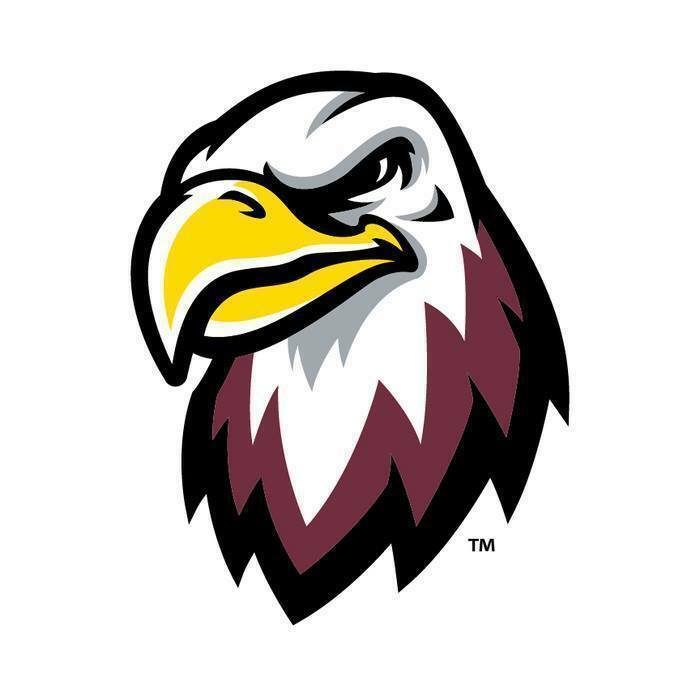 Congratulations to the Crossett Eagles for their 23 to 14 win over the Star City Bulldogs!! 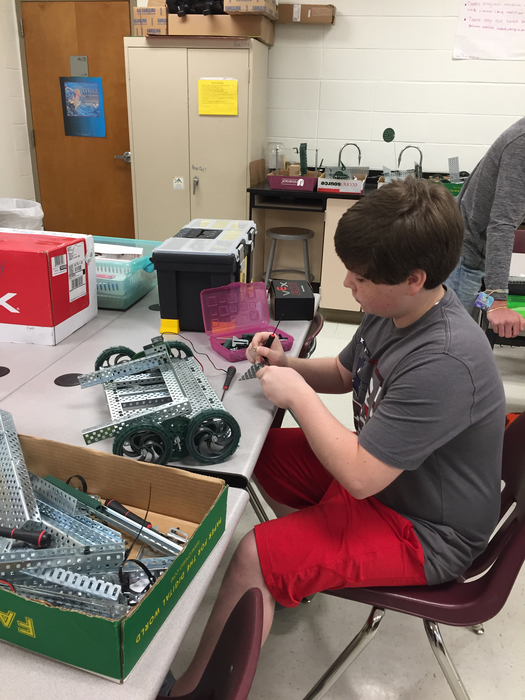 Suoer excited to observe students engaged in building competition robots in Mrs. Todd's PLTW Robotics class. 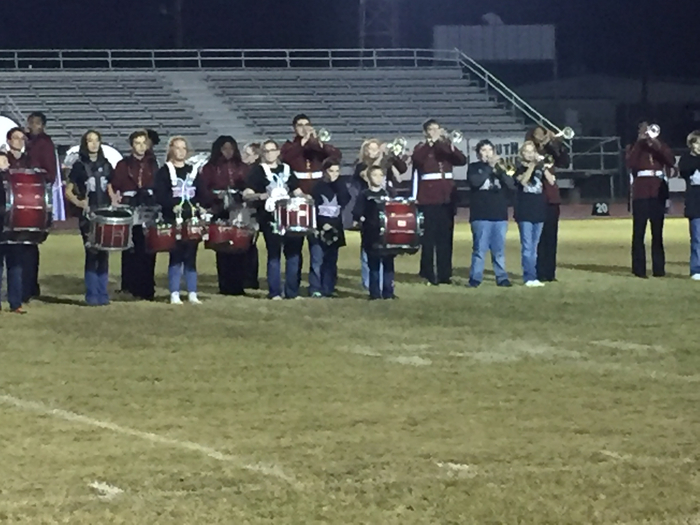 The CHS and CMS bands gave a great performance at the game Friday night despite the cold and rainy weather! Great job! 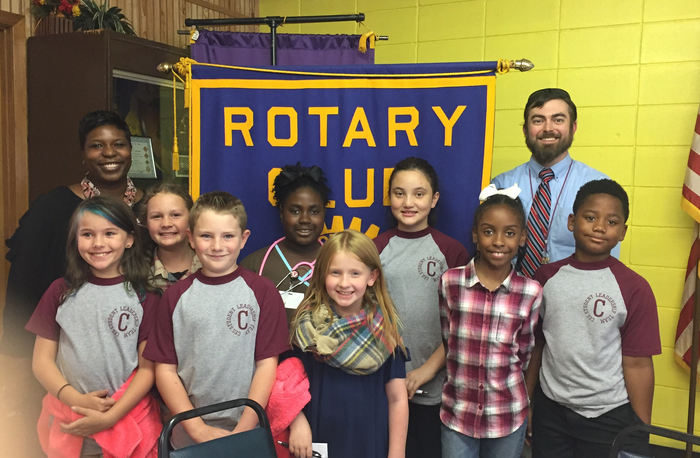 CES Leadership Team did an awesome job today at Rotary sharing about their hurrican relief project. Community leaders of the future! Congratulations to Tramesha Lewis & Brooke Courson, CHS Seniors honored as Jr. Rotarians today! 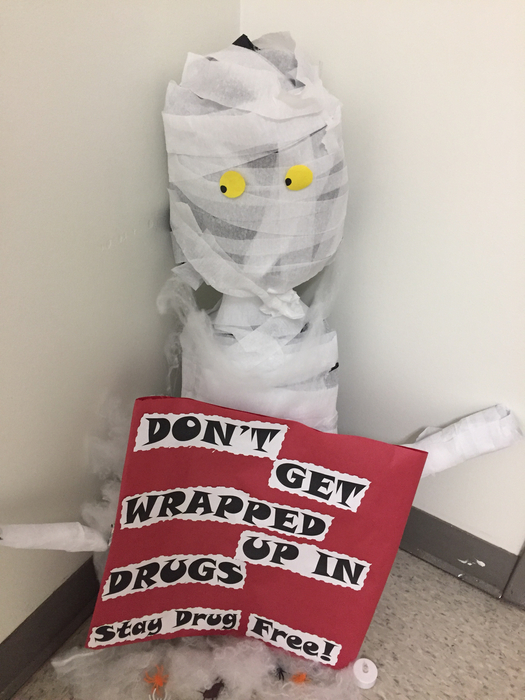 It's Red Ribbon Week in the District. The Theme: The Future is Key, so Stay Drug Free is being shared with our students. Thank you to our Cheerleaders for decorating our school bus representing Bus Safety Week. Computer Science for Innovators and Makers is a new PLTW course offered at CMS by Chuck Hollis. Throughout the unit, students will learn about programming for the physical world by blending hardware design and software development, allowing students to discover computer science concepts and skills by creating personally relevant, tangible, and shareable projects. 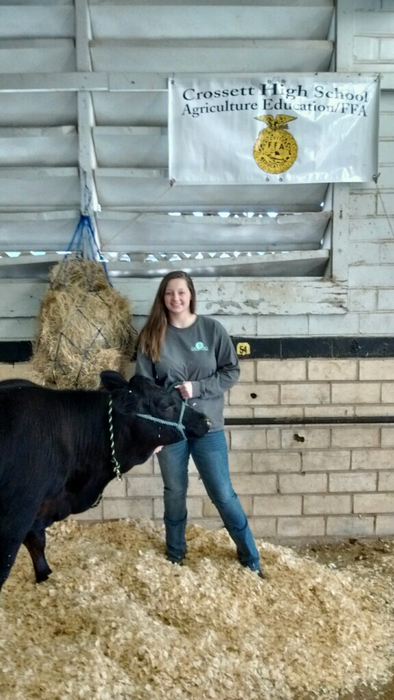 Paige Thompson at Arkansas State Fair. Ready to go-to Weigh In and find out show order for tomorrow. 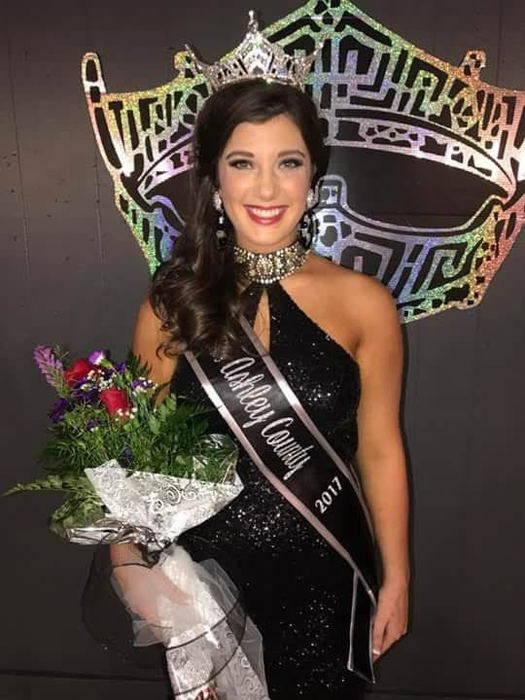 Congratulations to Anna Rice! 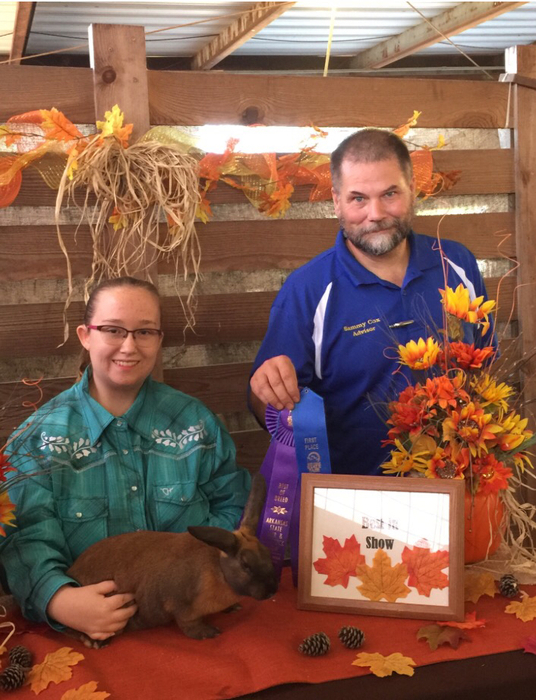 Arkansas State Fair, First in her class, Best of Breed- Cinnamon. CMS Coffee & Conversation: 8th grade parents meet & talk with Summit Teachers, 10-12-17 @ 9:30 am. CSD's Parent Teacher conferences will be Monday, October 16, from 12 noon until 6 p.m. We look forward to visiting with you so hope you will make plans to attend. District Leadership Team planning together. Great work being done for our students! CMS has been searched and cleared and the students have been returned to the building. There was a call made to Crossett Middle School, and though it was not deemed very credible, we are taking it seriously and in an abundance of caution the students have been evacuated from the building. The building is being searched with the assistance of law enforcement. When we feel it is safe for the students and staff, we will return to the classroom and continue with school. 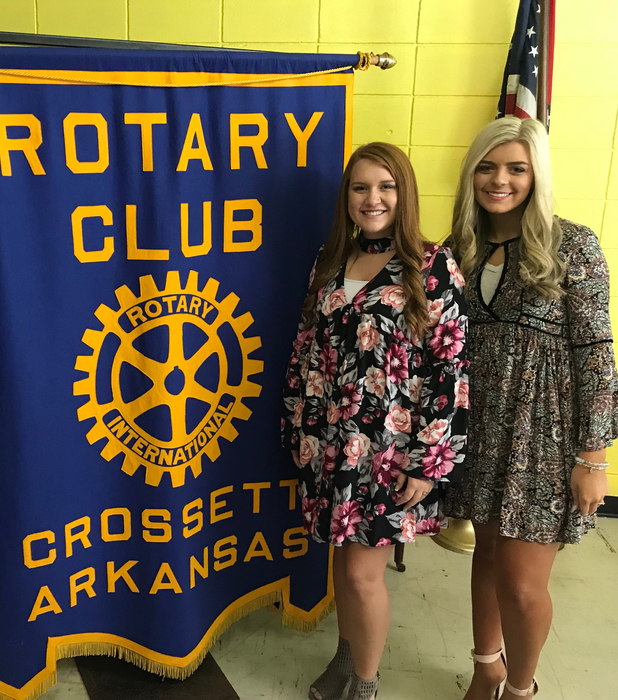 Congratulations to Mary Willink and Amber Sisson, CHS Seniors, for being selected as Jr. Rotarians of the Crossett Rotary Club! SR. PARENT/STUDENT MEETING: There will be a Senior parent and student meeting on Thursday, September 28th at CHS to learn about financial aid. The meeting will start at 6:00 p.m. and will be held in the library. 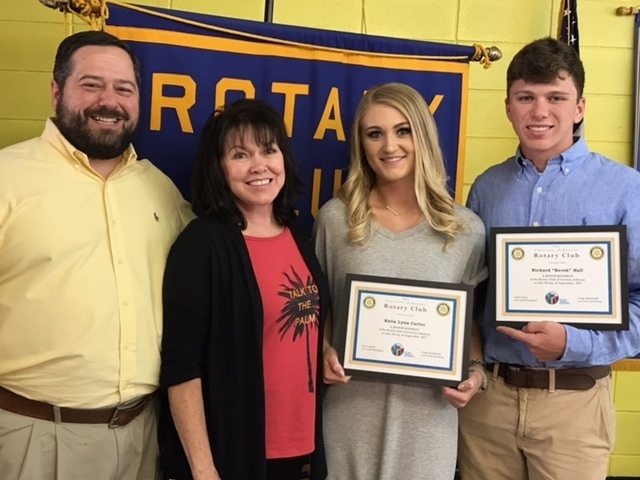 Congratulations to CHS Seniors, Carson Gilbert and Grace Wright, who were selected to be Jr. Rotarians of the Crossett Rotary Club. 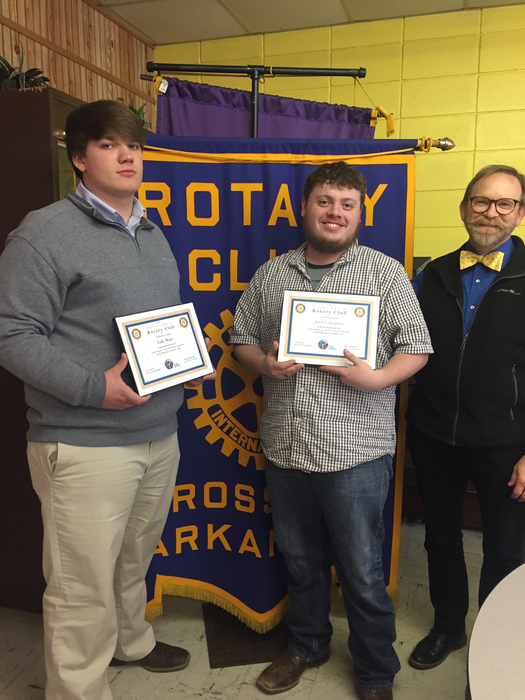 Congratulations to Shelby Burnside and Colin White, CHS Seniors who became Jr. Rotarians of the Crossett Rotary Club! 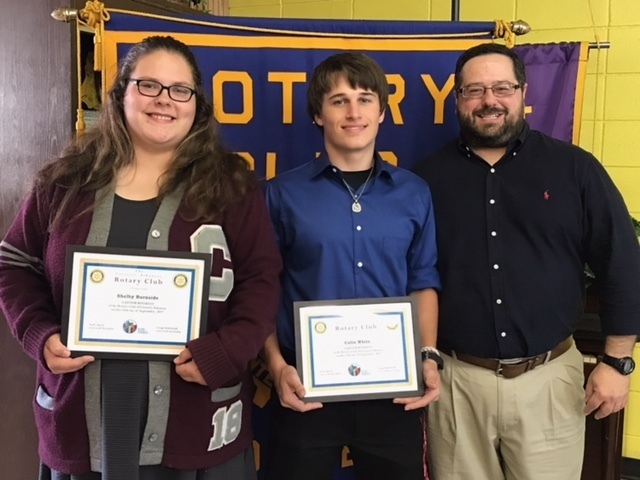 Congratulations to Katie Lynn Carter and Richard "Kersh" Hall for becoming Jr. Rotarians of the Crossett Rotary Club! Please follow Crossett School District on Twitter using @CSDEagles_News! Congratulations to Carson Grannon and Daylan Deal, Crossett High School Seniors who became Jr. Rotarians of the Crossett Rotary Club today!